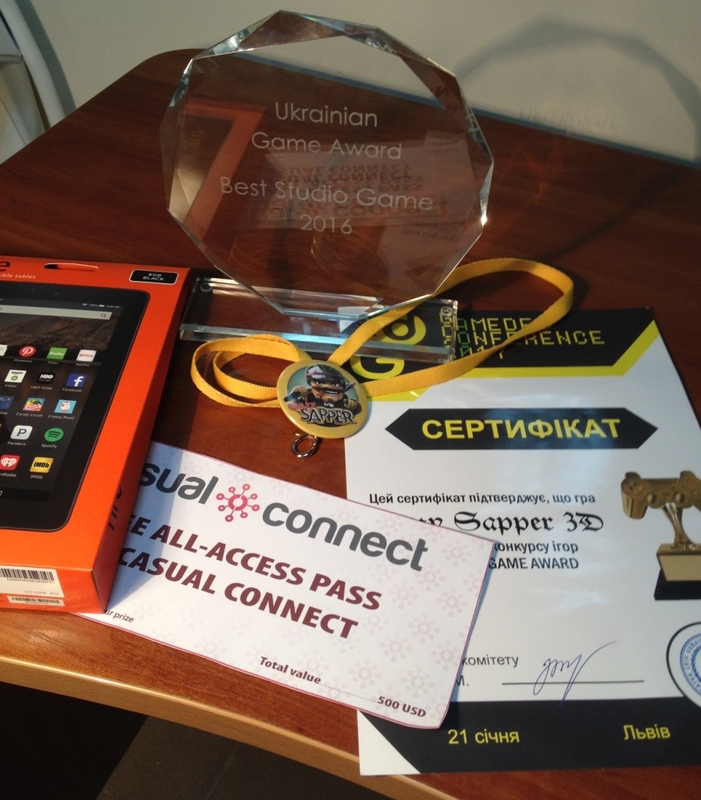 We are so proud to announce that our game Crazy Sapper 3D became the "Best Studio Game 2016" on Ukrainian Game Award at Lviv GameDev Conference 2017 and was awarded with free all-access passes to Casual Connect and Fire tablet from Amazon! 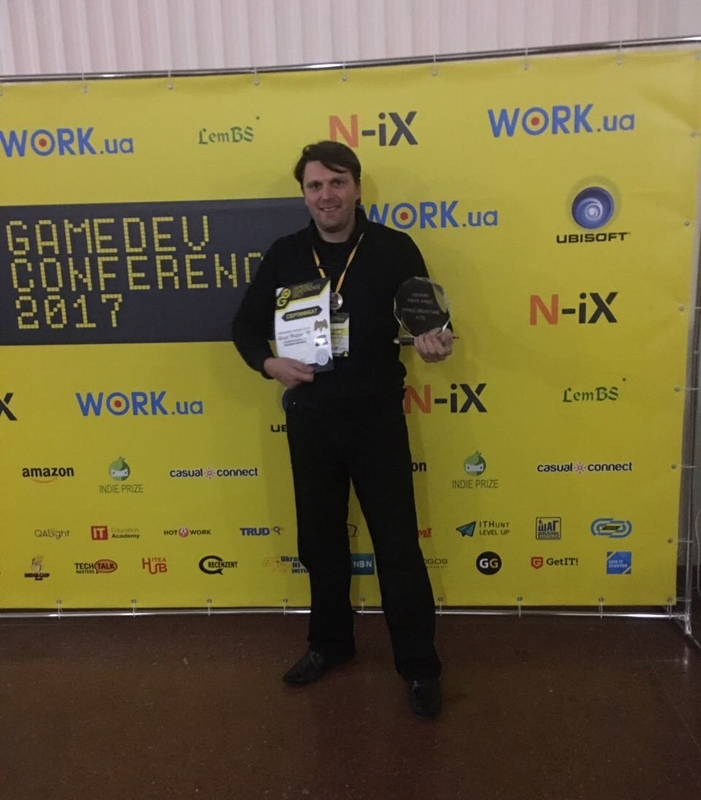 GameDev Conference Lviv 2017 is a far-reaching conference held in Lviv for game developers. The event will gather about 50 speakers and over 500 participants from all over Ukraine on 5 simultaneous streams during one day. Delivered presentations will encompass all stages of game development: from coming up with an idea to entering global markets. You will hear success stories, useful tips and life-hacks from developers, learn how to creat your own studio, what game mechanics and marketing strategies to use, how to develop good graphics and quality sound for a game. Dear collegues, partners and players! We, the ARATOG team, are glad to wish you a Merry Christmas and a Happy New 2017 Year! Dear collegues, partners and players! We, the ARATOG team, are glad to wish you a Merry Christmas and a Happy New 2017 Year! It is that time of the year again, when you are thankful for everything merry and bright. May this Christmas be a delight! Wishing you a Happy Holidays! Russia's first conference devoted to investments and integration of Russian business into the international market of eSports. 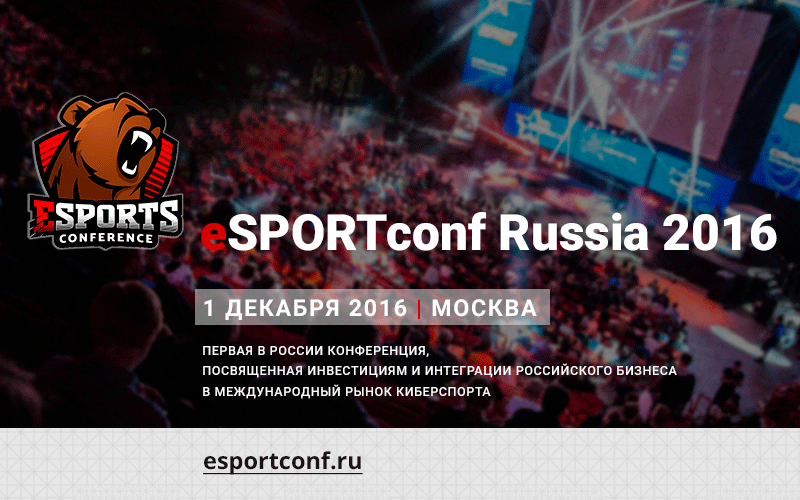 We are happy to announce an unique event of Aratog's infopartner - eSPORTconf Russia 2016 - Russia's first conference devoted to investments and integration of Russian business into the international market of eSports, which will tookplace on December 1st in Moscow. Using the mechanisms of business to business dialogue, it is planned to examine objectively the situation on the development of priority sectors of investment and integration of Russian business into the international market of eSports on the basis of traditional and innovative solutions, to discuss and prepare proposals for the improvement and further development of the situation in this sphere in order to improve competitiveness and the economic efficiency of e-sports industry in Russia on both domestic and international markets. 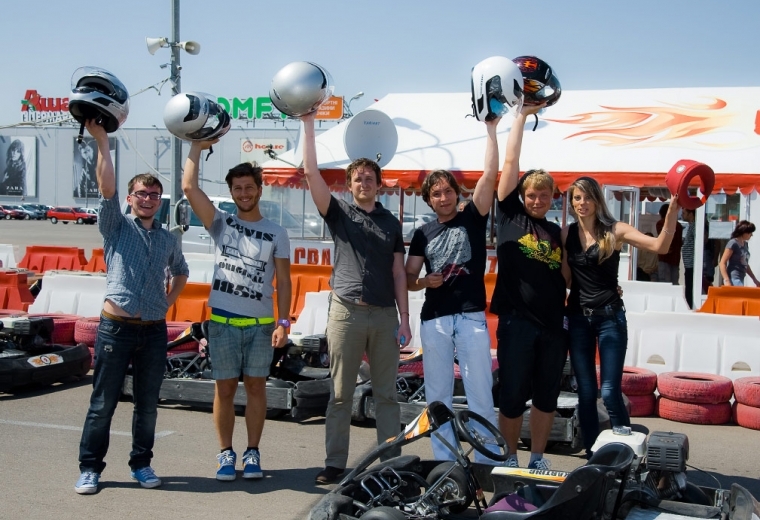 eSports: Is it a traditional sport or a commercial business model? 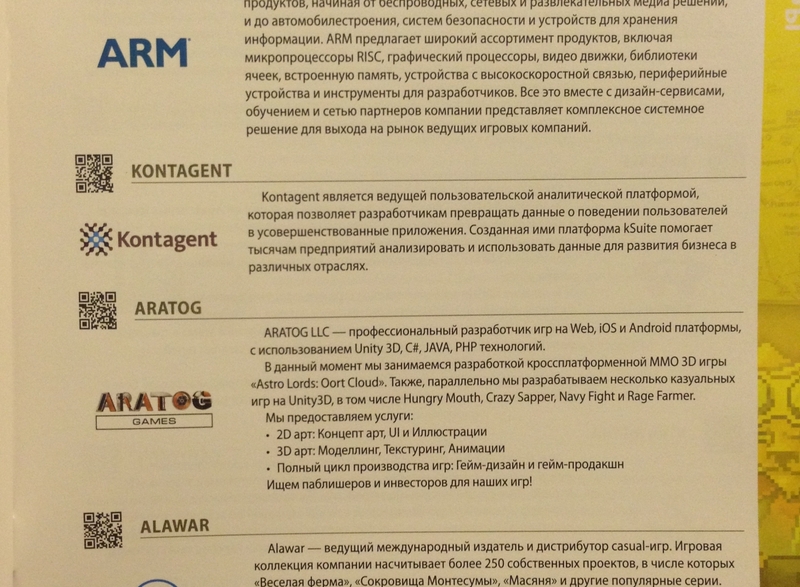 ARATOG will attend 4C: Kyiv at 23-24 September. 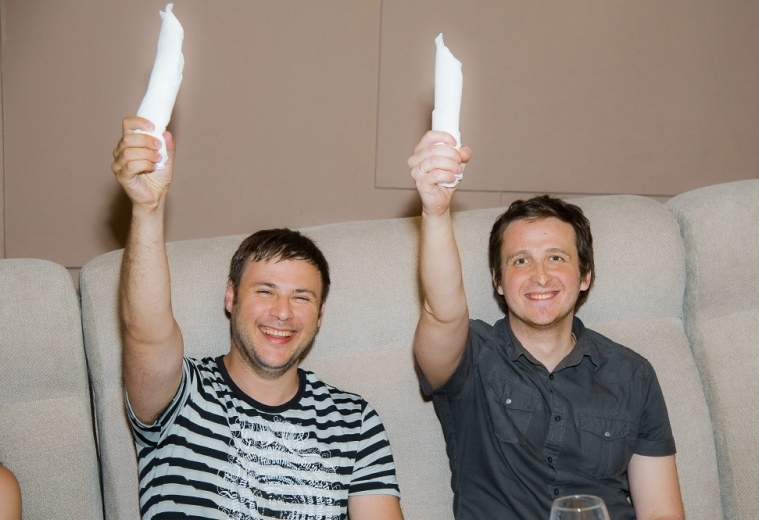 Meet our CEO and Executive Producer - Arseniy Nazarenko. Our main goal for this conference is to meet with our current partners and meet new ones. We are looking for publishers for Web, PC and mobile platforms for our main huge MMO 3D strategy game "Astro Lords: Oort Cloud" and investors for other multiplatform titles in development as well! 4C: Kyiv is a conference for world leading video game experts and specialists who drive change, not simply adjust to it. Under the banner “Create. Craft. Communicate. Collaborate.”, this event assembles like-minded professionals to share their thoughts and knowledge, network with the industry’s key decision makers, gain valuable insight in development and publishing, define trends that will shape the industry for years to come, and get inspired. 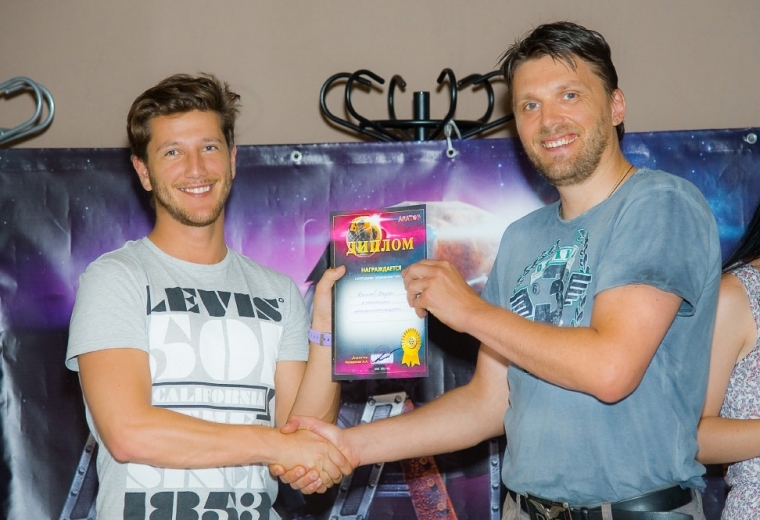 Company Aratog Games announced its participation in a thematic convention Fan Expo Odessa in 2016 as a partner of the event, which will present the popular space MMO strategy Astro Lords: Oort Cloud. 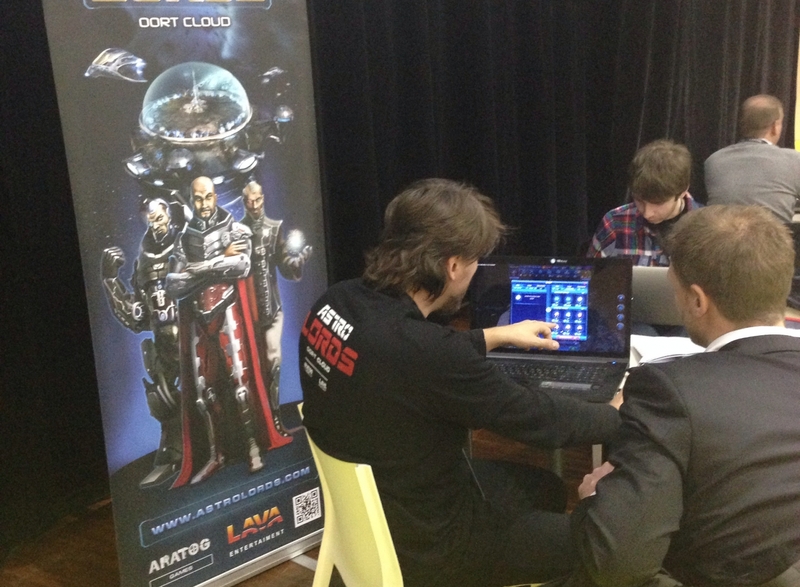 Company Aratog Games announced its participation in a thematic convention Fan Expo Odessa http://fanexpo.com.ua/ in 2016 as a partner of the event, and to present the popular space cross-platform MMO strategy “Astro Lords: Oort Cloud”. Unique exhibition Fan Expo Odessa held August 13-14 in exhibition center of Odessa Sea Port. The event was created to promote the interests of young people today, such as comic books, movies, TV shows, board and video games and literary fiction. Program of Fan Expo Odessa includes stage costume show, an exhibition of creative works, the fair thematic products tournaments on the computer and board games, interactive entertainment, film screenings, presentations, lectures and workshops on various subjects, and other recreational activities. Company Aratog Games, as a partner of the event, will present its thematic booth dedicated to the game world of MMO strategy "Astro Lords: Oort Cloud" will hold a series of competitions for visitors to the event, including photo contest, Astrolords’s mini-tournaments on fights in the Arena, competition for the best cosplay, blitz quiz on the space theme and showcasing the best videos repetitions of mass battles of the game! And all the players who will visit the booth Astro Lords at the event Fan Expo Odessa 2016 will get promotional codes and receive valuable gifts. Come and join Aratog team at Fan Expo Odessa 2016! 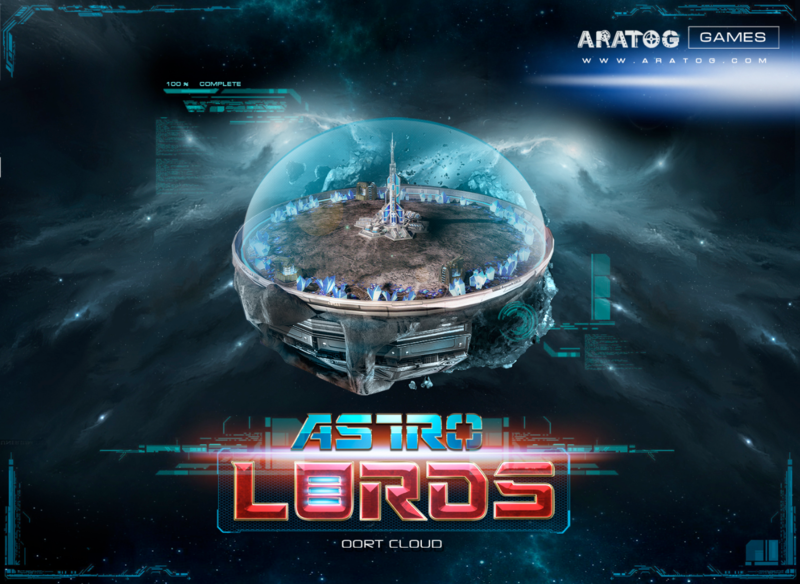 Tartezal Holdings Company, together with the developer Aratog Games announces the release of the popular three-dimensional multiplayer strategy Astro Lords on the App Store and Google Play. 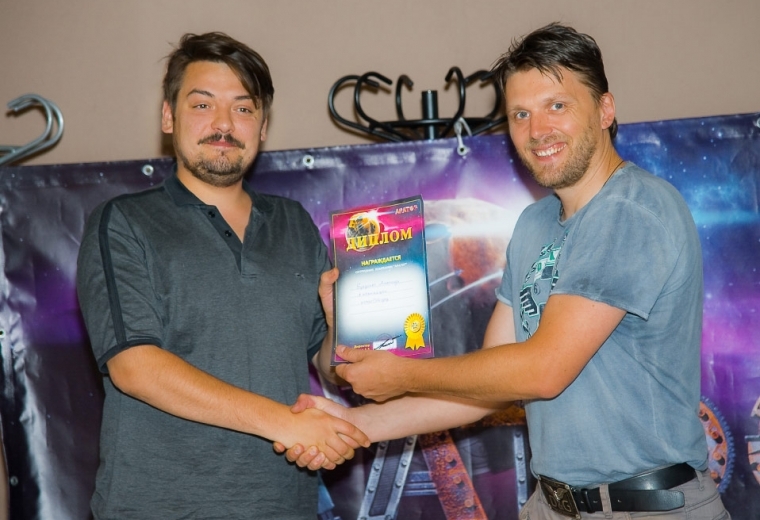 Game - Winner in the category "Best Art" at the Indie Game Cup 2015, in addition to high-quality graphics, the gameplay offers players an exciting, user-friendly interface and unique modes of PvP and PvE battles in the arena. 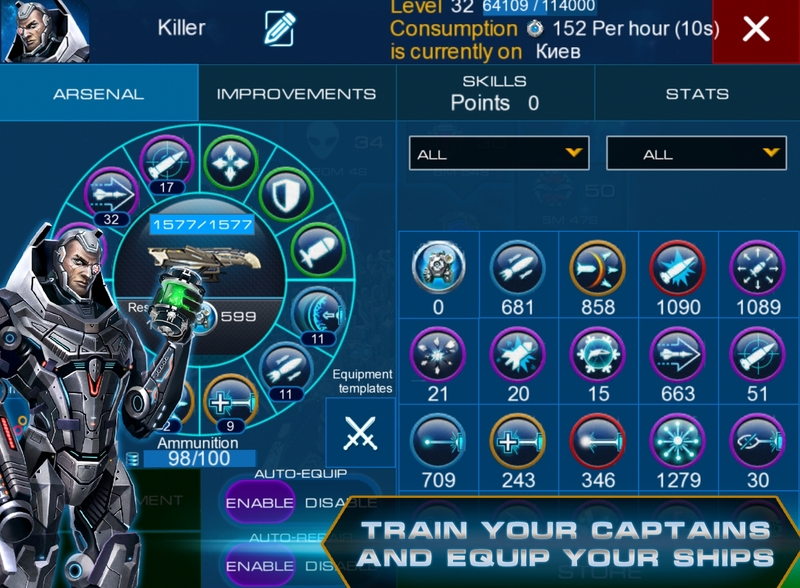 Astro Lords: Oort Cloud is a cross-platform massively multiplayer online 3D strategy with combat management in real time. A combination of space simulator, strategy and RPG, the game proposes to a player the role of an Astro Lord – a mighty ruler of its own asteroid in the Oort Cloud. Fighting against AI and other Lords, the player should gradually build up his or her space empire by constructing factories, mines, setting up defenses and designing space ships to conquer other asteroids and expand the territory. Trading and cooperation with other players and unique real-time space battles are also a weighty part of the game. A key feature of this MMO-Strategy is a persistent game universe, because of Cloud-technology server by own design, the accounts of players are the same for all supported platforms: iOS, Android, PC (Windows, MacOS, Linux), Steam, Web browsers. 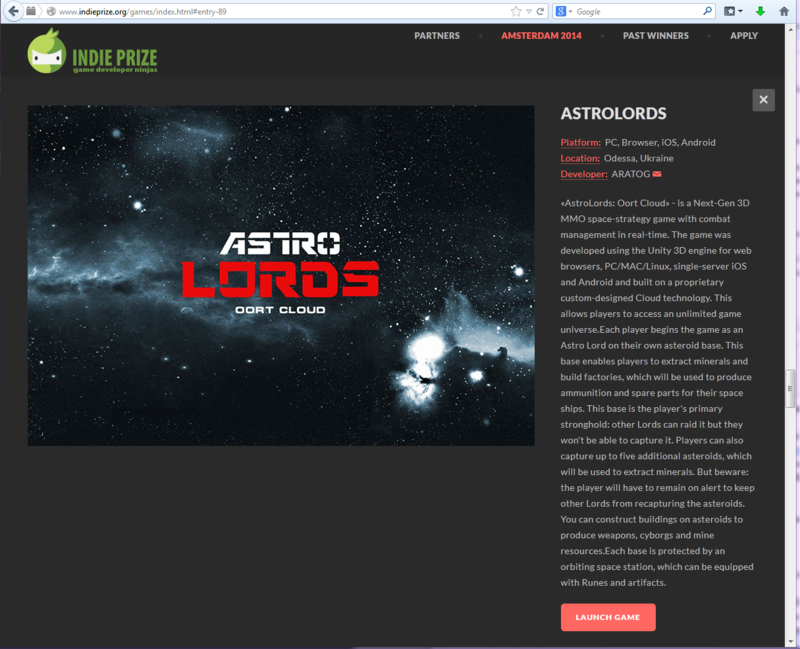 Astro Lords was nominated for European Selected Projects Awards 2013 in the “Social, Casual & Online” Category among 184 games reviewed, nominated at Indie Prize Showcase in Amsterdam, nominated at DevGamm Play in Belarus and on the Indie Game Cup 2015 in Moscow, won in the category "Best Graphics". Game received many positive feedback from players and the media. AstroLords is a free-to-play MMO game available for iOS (iPhone, iPad), Android, PC (Windows, Mac OS, Linux), Steam. The game can also be played in a browser with Unity 3D plugin installed. Tartezal Holdings Ltd. a company founded by experienced professionals in the gaming industry and specializes in the publishing of a cross-platform MMO games. 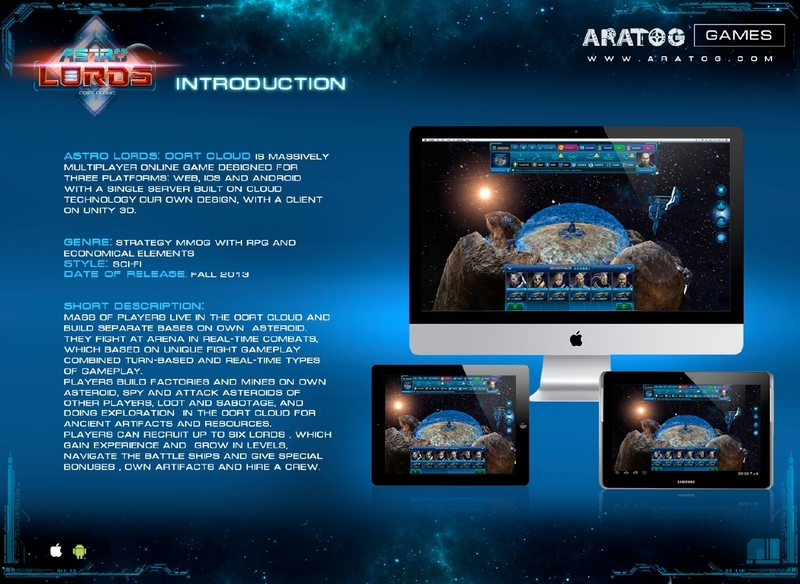 The debut of the project is the game Astro Lords: Oort Cloud - an innovative 3D MMO strategy developed with Unity3D for Web, PC (Windows, MacOS, Linux), Steam, iOS (iPhone, iPad), Android devices. 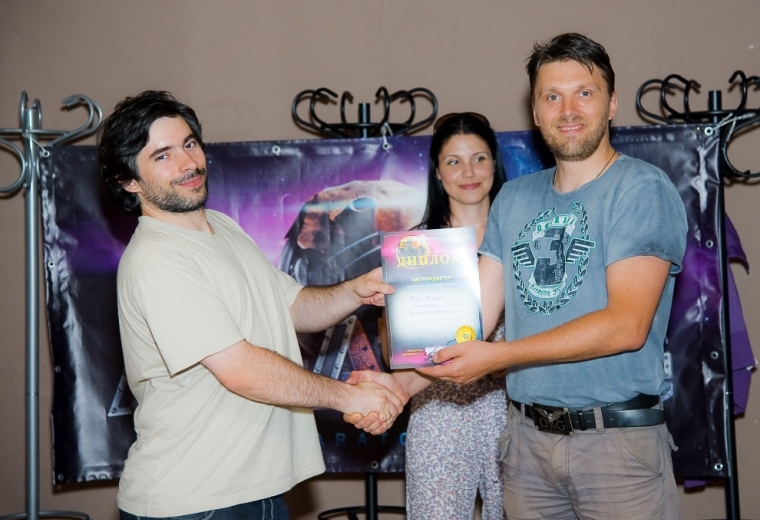 We are glad to announce that our MMO game «Astro Lords:Oort Cloud» was nominated for "Best Game" and won for "Best Art" in the second contest of the championship game projects - Indie Game Cup 2015. 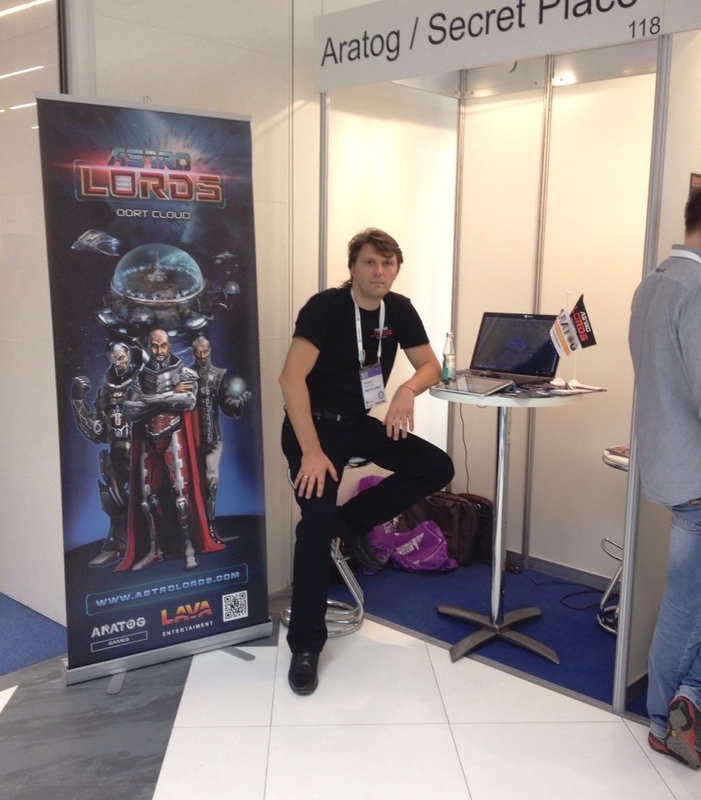 Also, Astro Lords took part in the exhibition in the framework of development Conference on the development and promotion of games White Nights Moscow, which took place 13th and 14th October in Moscow. 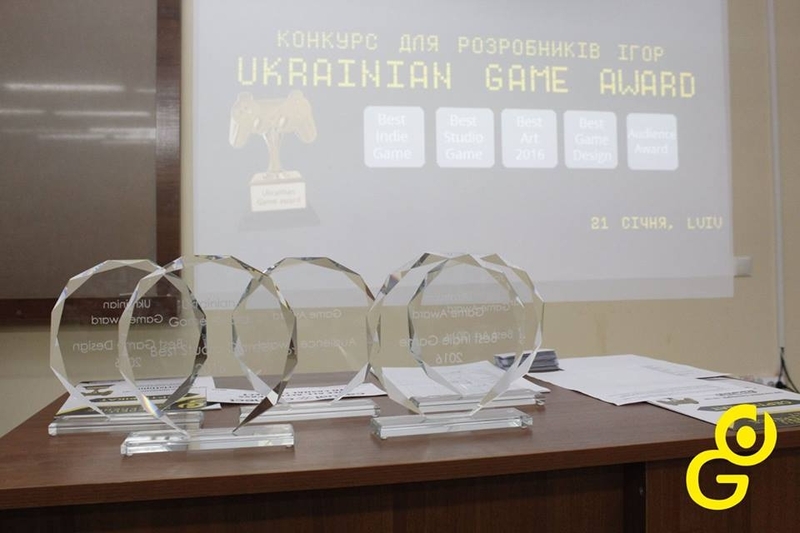 The whole Aratog Games team is proud of the project and the nomination victory by the eminent jury. We will try to make the game even better, thanks to all those who are with us! 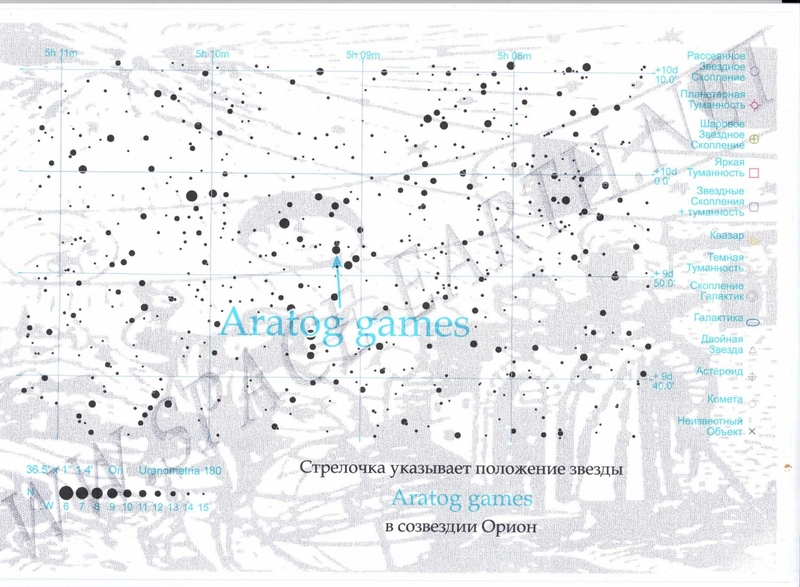 ARATOG will attend White Nights Moscow 2015 - Game Conference at 13-14 October. 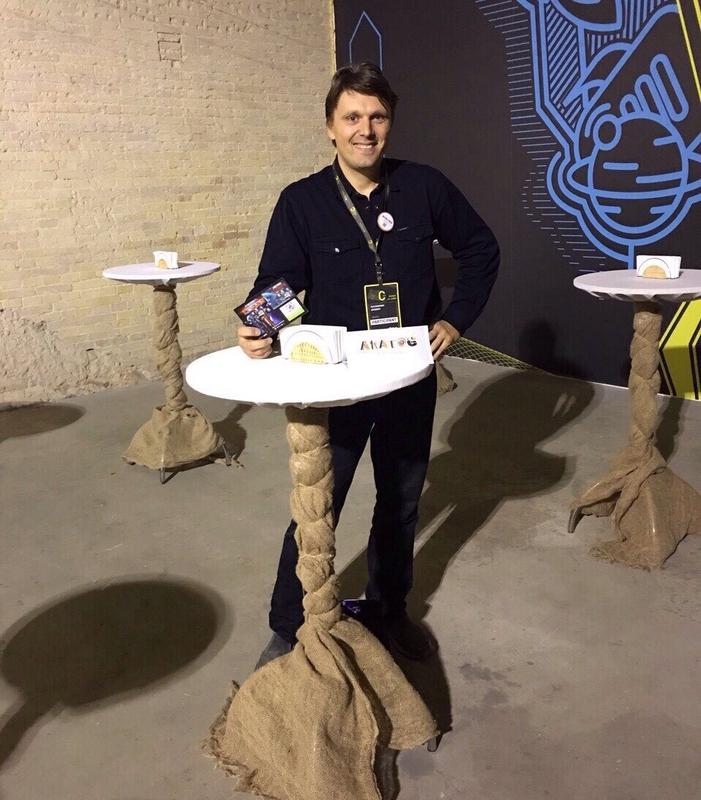 Come visit our booth #118 at October 13th and meet CEO and Executive Producer - Arseniy Nazarenko. Our main goal for this conference is to meet with our current partners and meet new ones. 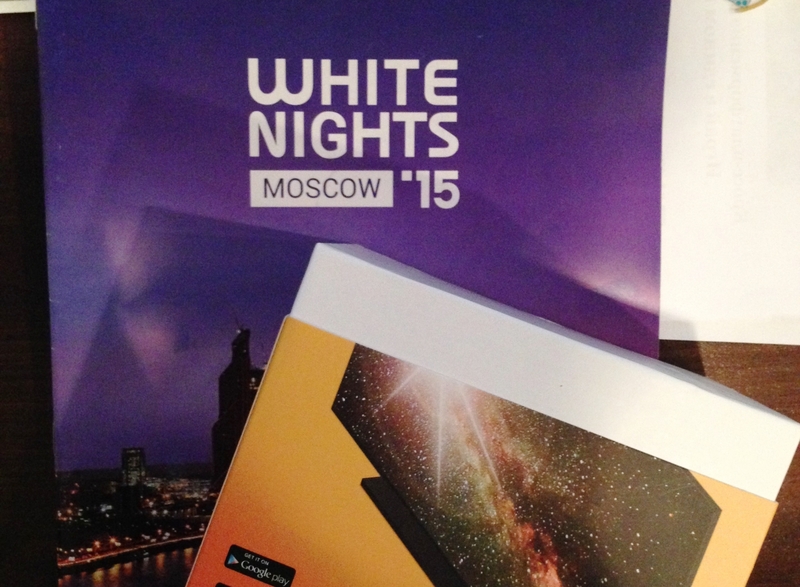 ARATOG will attend White Nights Moscow 2015 - Game Conference at 13-14 October. Come visit our booth #118 at October 13th and meet CEO and Executive Producer - Arseniy Nazarenko. Our main goal for this conference is to meet with our current partners and meet new ones. We are looking for publishers for Web, PC and mobile platforms for our main huge MMO 3D strategy game "Astro Lords: Oort Cloud" and investors for other mobile titles in development as well! 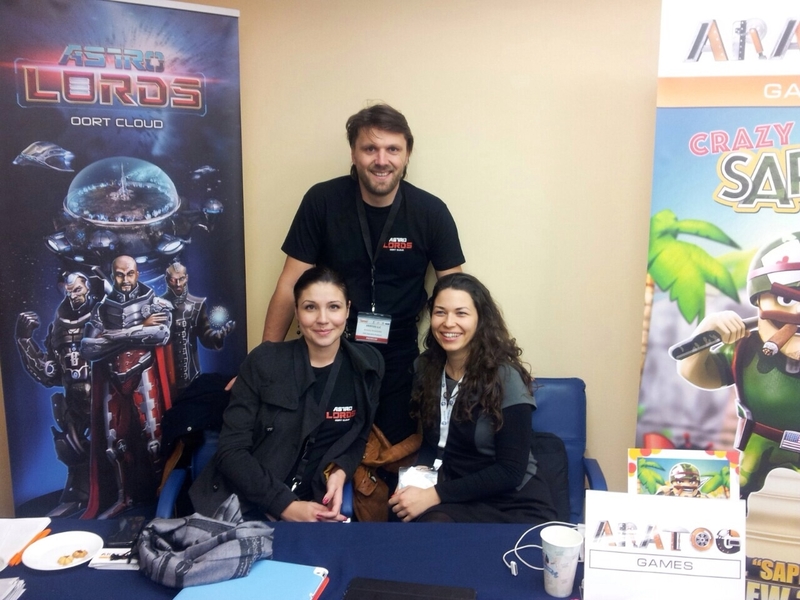 Company Aratog Games announced its participation in a thematic convention Fan Expo Odessa in 2015 as a partner of the event, which will present the popular space MMO strategy Astro Lords: Oort Cloud. 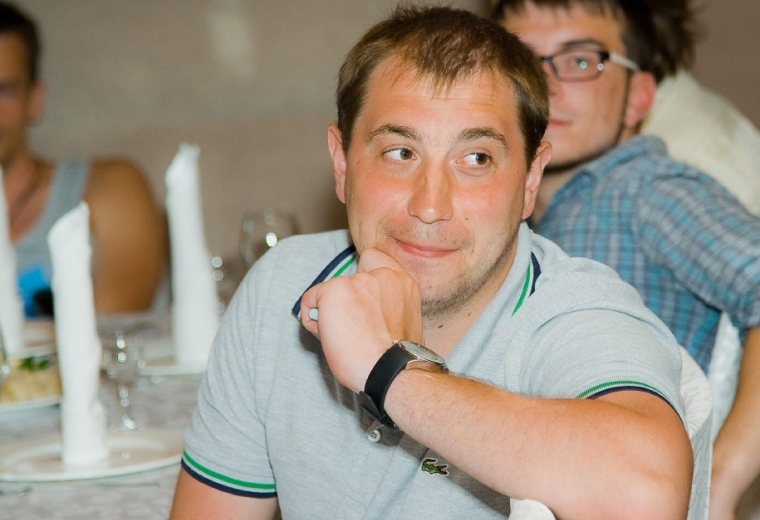 Also, CEO of Arseniy Nazarenko will made a presentation about the birth of the gaming universe Astro Lords. The goal of unique exhibition Fan Expo Odessa held August 15-16 in concert and exhibition complex of Odessa Sea Port. The event was created to promote the interests of young people today, such as comic books, movies, TV shows, board and video games, as well as literary fiction. 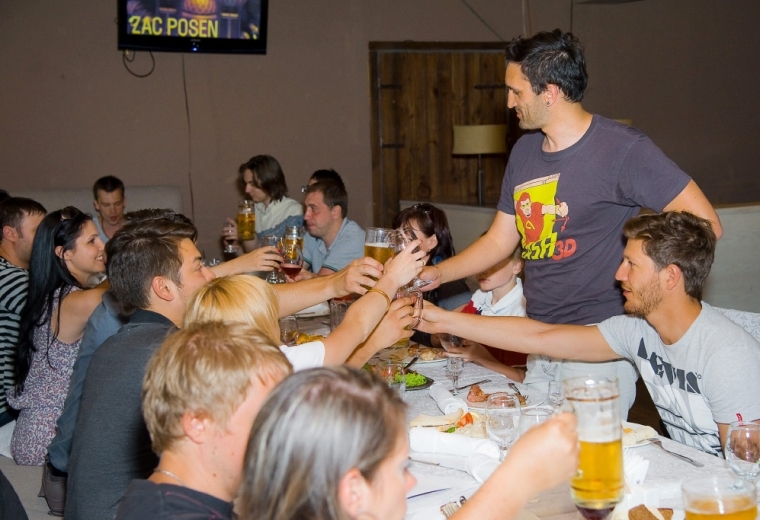 Program of Fan Expo Odessa includes stage costume show, an exhibition of creative works, the fair thematic products tournaments on the computer and board games, interactive entertainment, film screenings, presentations, lectures and workshops on various subjects, and other recreational activities. Company Aratog Games, as a partner of the event, will present its thematic stand dedicated to the game world MMO strategy "Astrolords: Oort Cloud" will hold a series of competitions and quizzes for visitors to the event, including photo contest, Astrolords’s mini-tournaments on fights in the Arena, competition for the best cosplay, blitz quiz on the space theme and showcasing the best videos repetitions of mass battles of the game! And all the players who will visit the stand Astro Lords at the event Fan Expo Odessa 2015 will get promotional codes and receive valuable gifts. 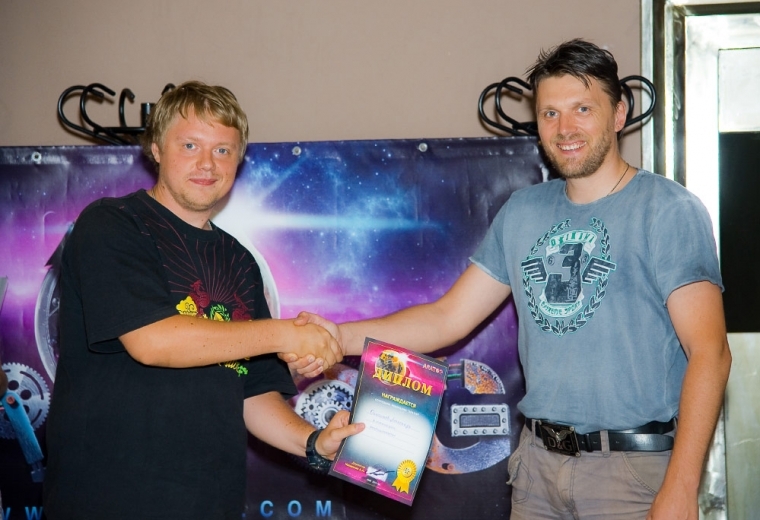 And visitors Fan Expo Odessa can expect an exciting presentation on the development and production of a unique project Astro Lords from the founder and CEO - Arseniy Nazarenko, which will be held in the conference room at Saturday, 15th August. 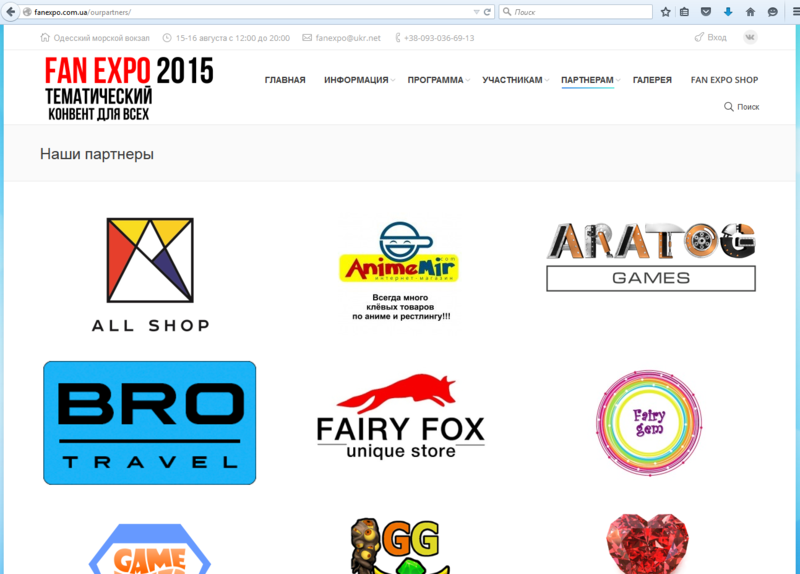 Come and join Aratog team at Fan Expo Odessa 2015! 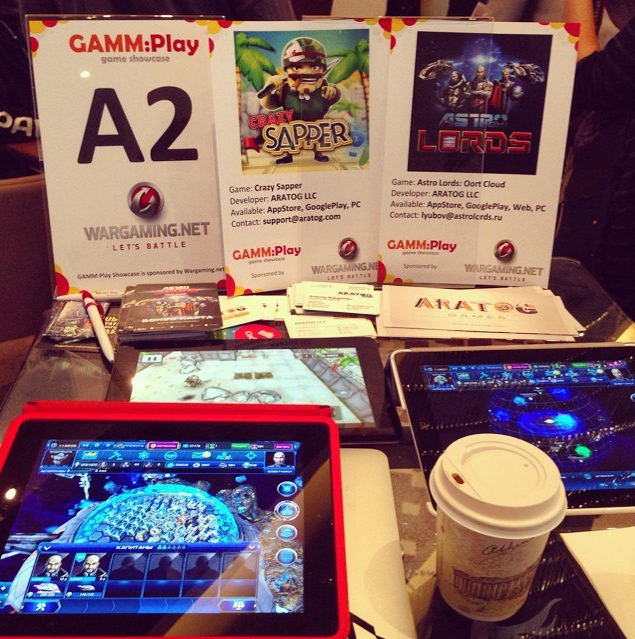 ARATOG LLC will attend DevGamm Moscow 2015 - Game Conference in Moscow, Radisson Blu Hotel at 15-16 May. From ARATOG will be attending CEO and Executive Producer - Arseniy Nazarenko. Home to more than 3,500 titles, Steam is a great place to discover exciting new games. Astro Lords: Oort Cloud is now on the journey to becoming one of those games, and we'd like your help! 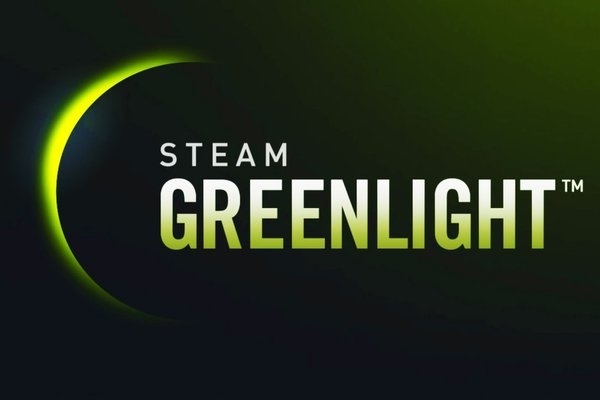 To become a part of the Steam library, games must be voted for by members of the Steam community in a section called Greenlight, where players can say whether they would play the game or not. If Astro Lords gathers enough support it could be added to Steam, providing a new source of players (over 100 million potential friends or enemies!) along with new opportunities and challenges. If you're a Steam member, we would greatly appreciate it if you could visit Astro Lords: Oort Cloud on Steam Greenlight and click "Yes" to show your support. 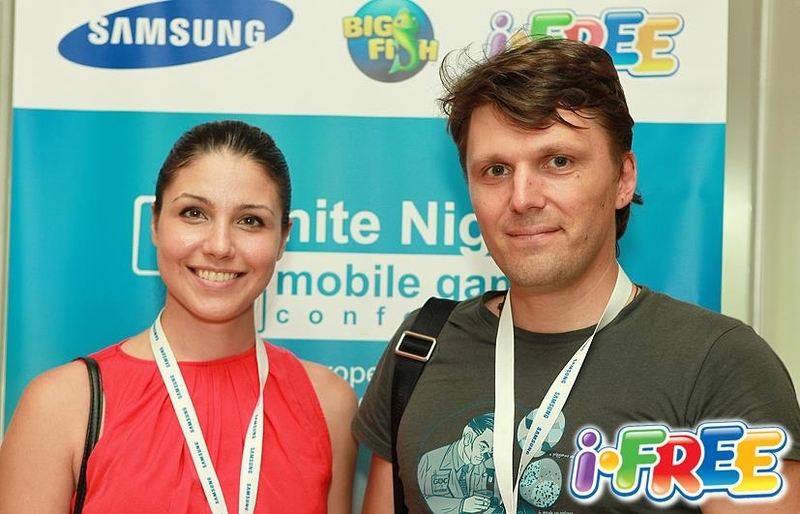 ARATOG LLC will attend Winter Nights 2015 - Mobile Games Conference in St. Petersburg. We showcased our games Crazy Sapper and Astro Lords: Oort Cloud in showcase event GAMM:PLAY and presented souvenirs and gift cards for eveyrone at the event! 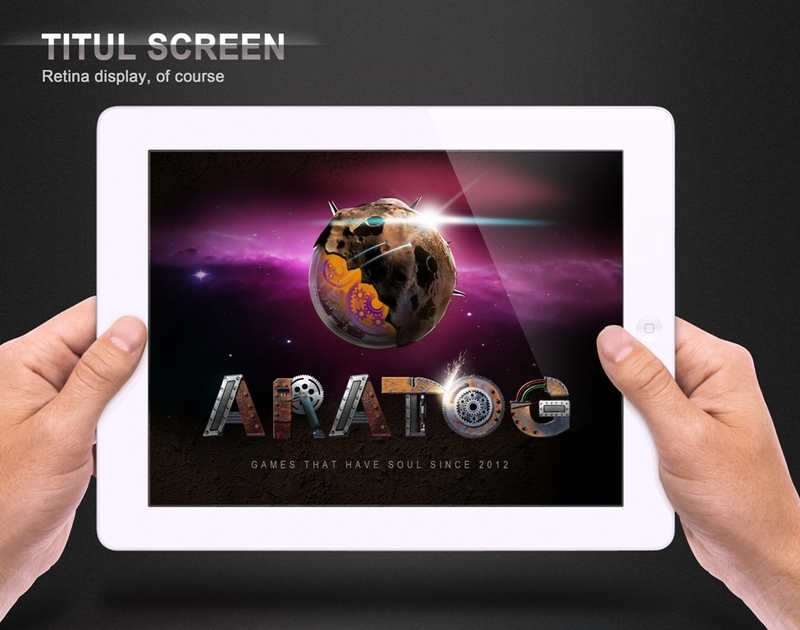 ARATOG Games in Behance - check it up! 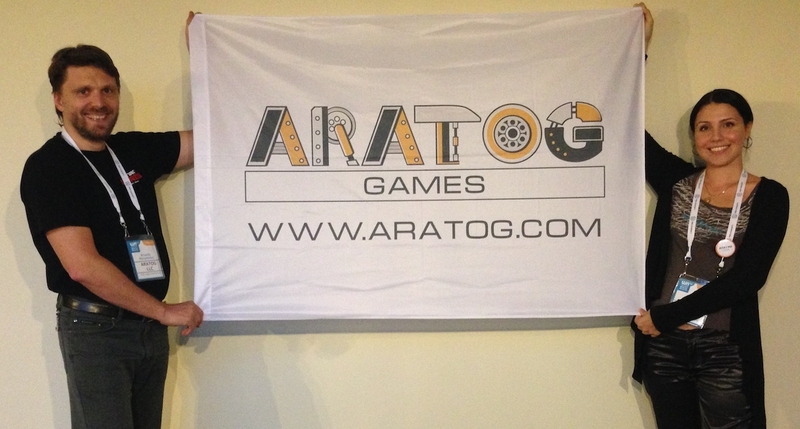 ARATOG Games will attend Gamescom 2014 in Cologne, Germany at 14th-17th August. Gamescom is the largest trade fair and event highlight for interactive games, with more than 340,000 visitors celebrated the `next generation of gaming` last year. Our puzzle game, based on famous Mineswepper mechanics, Crazy Sapper 3D - Free HD version is now available on WildTangent Games Portal for Android. Our puzzle game, based on famous Mineswepper mechanics, Crazy Sapper 3D - Free HD version is now available inWildTangent Games Portal for Android. Everyone can create an account and dive in right now, for free: https://astrolords.bisbog.com/en/. In Astro Lords, players build their own asteroid bases, send spies out to enemy territory, and shoot at other spaceships in drag-and-click arcade style PvP combat. Moving bases on a 3D spherical map makes Astro Lords unique, bringing an entirely new dimension to multiplayer challenges. Astro Lords also seamlessly combines three different gameplay genres - construction management, arcade-style shooting, and strategic raid warfare – into one cohesive experience. 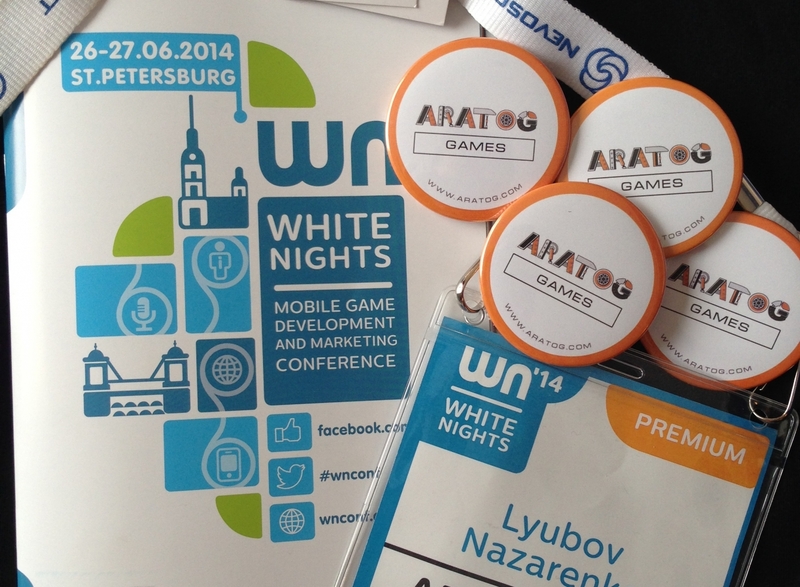 ARATOG LLC participated in mobile game developers conference White Nights 2014 www.wnconf.com , which took place in St. Petersburg 26-27th June. 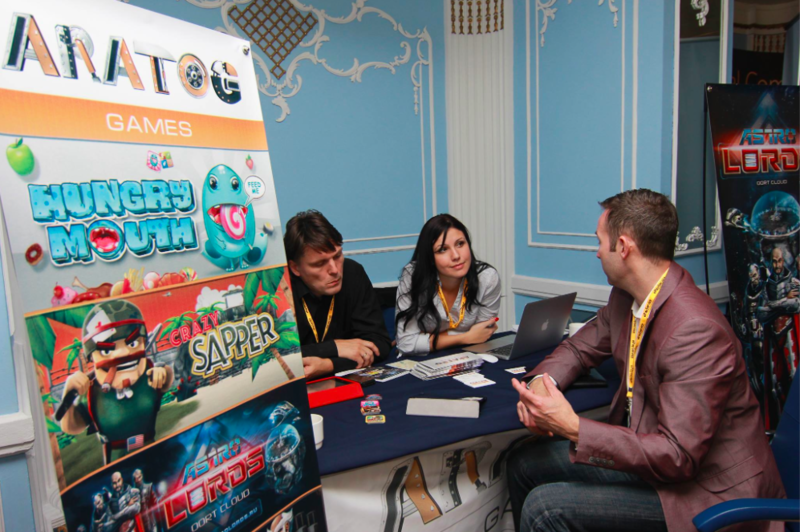 Made a lot of interesting and useful meetings, which opens new business opportunities for Aratog games. 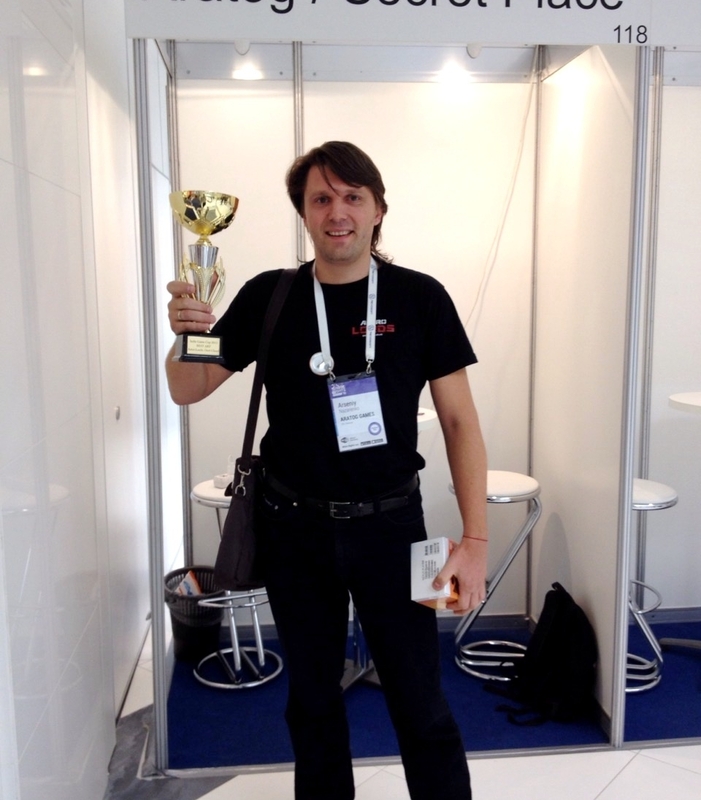 Everyone, who came to Aratog stand in Developers area, were awarded by gifts and souvenirs. Thanks to the organizers for such amazing conference! 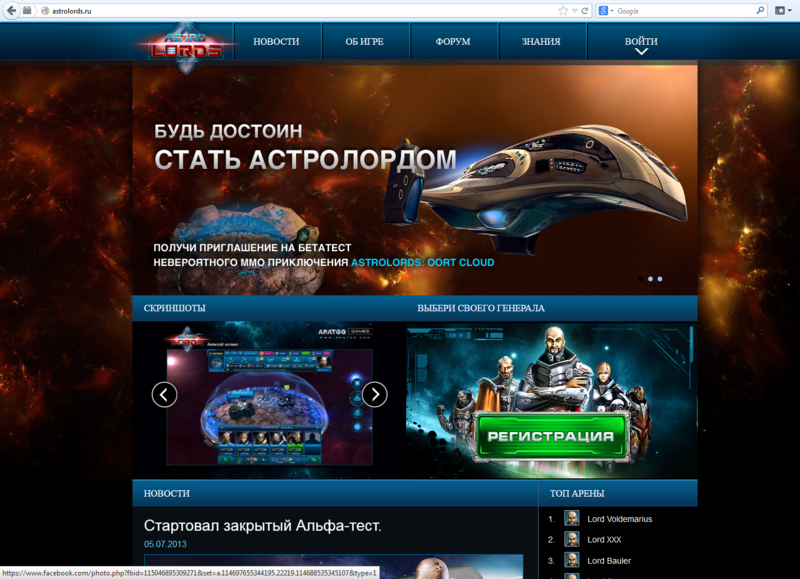 Aratog LLC, the developer of the multi-platform strategy Astro Lords: Oort Cloud MMO, releases the game in Russian-speaking countries and announces the release date in North America and Europe for Web and PC platforms with publisher BISBOG. 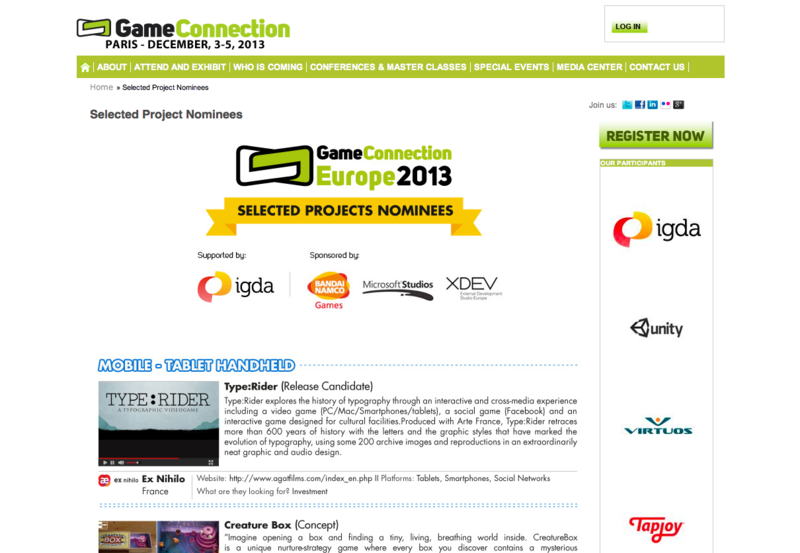 The multiplayer real-time strategy and the Selected Projects nominee on Game Connection Europe 2013 will be released on July 1, 2014. 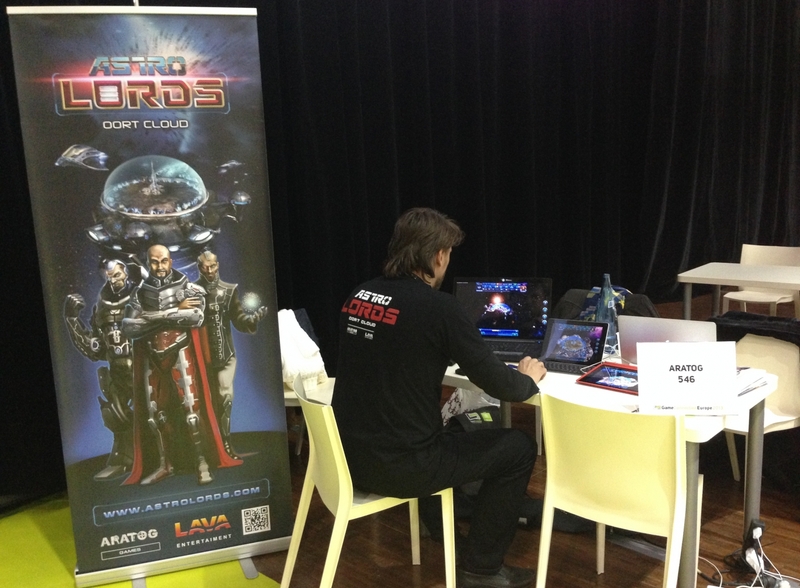 Astro Lords: Oort Cloud, a massively multiplayer strategy game, was presented as a beta on Game Connection Europe and Indie Prize Showcase Amsterdam 2014 game contests. The immersive gameplay of this in-depth space strategy with real-time battles didn´t pass unnoticed - the game became the finalist of both competitions. A distinctive feature of the game is a big seamless world all players explore and conquer, regardless of the device the game is run on, which is made possible by using Unity 3D engine. Astro Lords: Oort Cloud provides captivating gameplay as well as the ability to continue playing from the last checkpoint, even on a browser or different platforms (Windows, Mac OS, Linux). 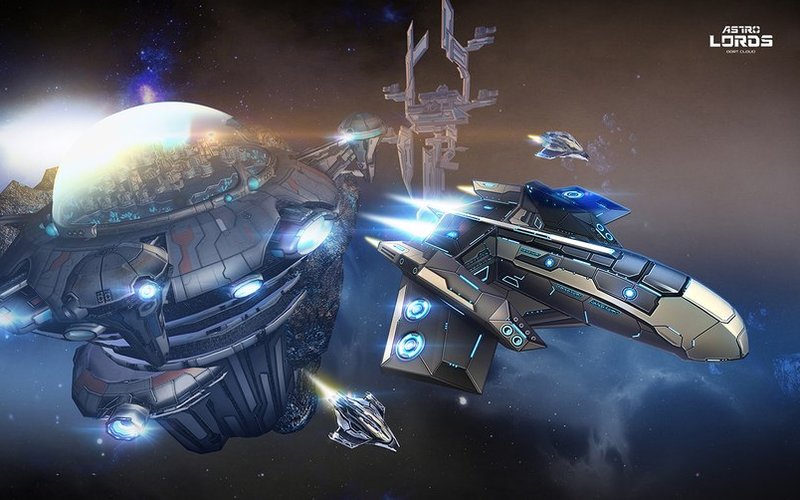 Combining base construction, research, real-time space battles and sophisticated player cooperation, the game delivers a whole new experience to all RTS genre fans. 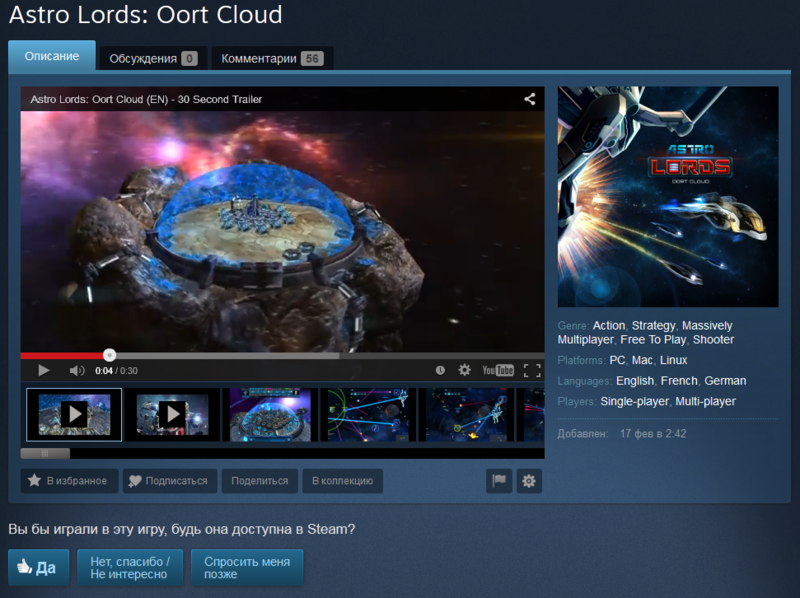 Now, with the Russian Web/PC version of Astro Lords: Oort Cloud released with Tartezal Holdings at the end of May, the European and US releases of this promising multi-platform MMORTS are in the pipeline, too. Specifically, BISBOG announces June 10 as the begin date of closed beta testing (CBT); the open beta (OBT) launches on June 17. The official release of the game in North America and Europe by BISBOG Group is planned for July 1, 2014. 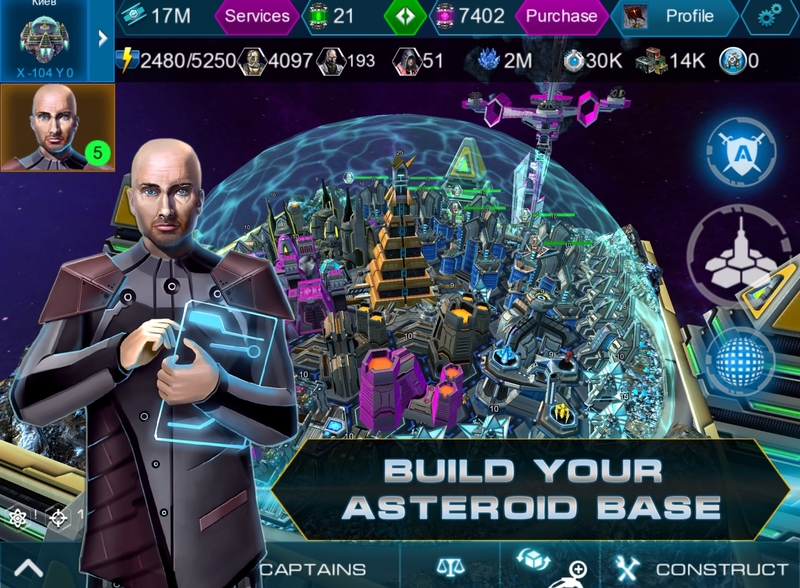 Currently, the company invites players to register on the game website at https://astrolords.bisbog.com/en/game/ to participate in beta testing. BISBOG also announces German and French versions that will be available several months after the release of English version for PC and Web. 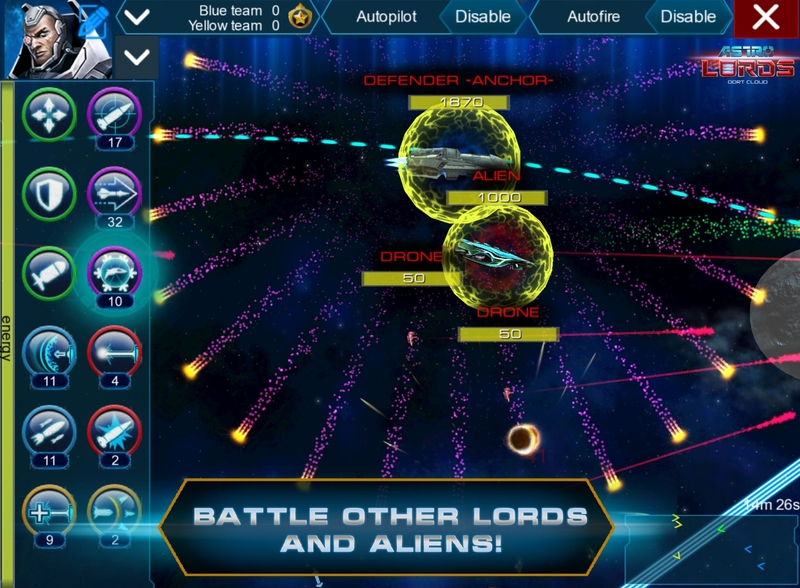 Astro Lords, a free-to-play MMO strategy game, will be available for Windows, Mac OS X and Linux platforms. The game will also be available in a browser with Unity 3D plugin installed. 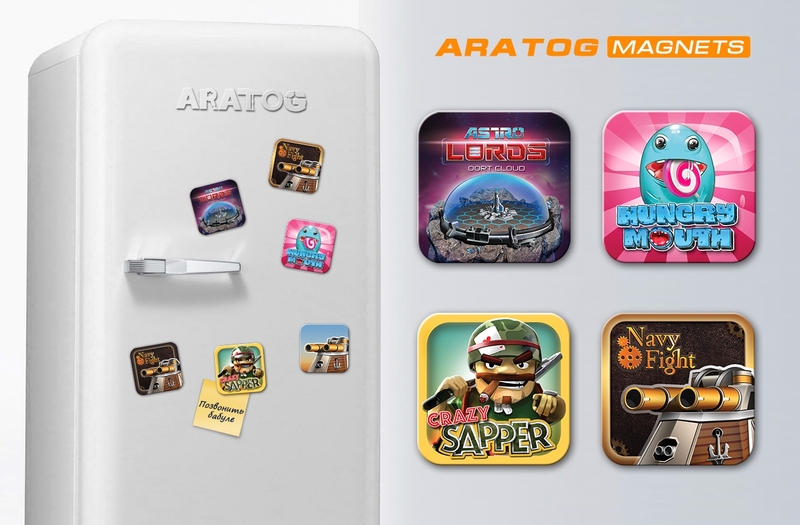 Aratog LLC is a professional game development company based in Odessa, Ukraine. Founded by experienced gaming specialists and headquartered in Limassol, Cyprus, Tartezal Holdings Ltd is a publisher of cross-platform MMO games for Russian speaking countries. The company´s first title is Astro Lords: Oort Cloud, a free-to-play MMO game available for Windows, Mac OS X, iOS (iPhone, iPad), Android, and browser on Unity 3D. May 14, 2014 was announced a licensing partnership between The BISBOG Group and Tartezal Holdings which will bring Astro Lords: Oort Cloud to English, German, and French language territories! Company Aratog LLC has managed to create the first MMORTS to combine three major game genres in a consistent world: construction management, arcade-style shooting, and strategic raid warfare. May 14, 2014 was announced a licensing partnership between The BISBOG Group and Tartezal Holdings which will bring Astro Lords: Oort Cloud to English, German, and French language territories! Company Aratog LLC has managed to create the first MMORTS to combine three major game genres in a consistent world: construction management, arcade-style shooting, and strategic raid warfare. Founded by experienced gaming specialists and headquartered in Limassol, Cyprus, Tartezal Holdings Ltd is a publisher of cross-platform MMO games for Russian speaking countries. The company’s first title is Astro Lords: Oort Cloud, a free-to-play MMO game available for Windows, Mac OS X, iOS (iPhone, iPad), Android, and browser on Unity 3D. Attention! 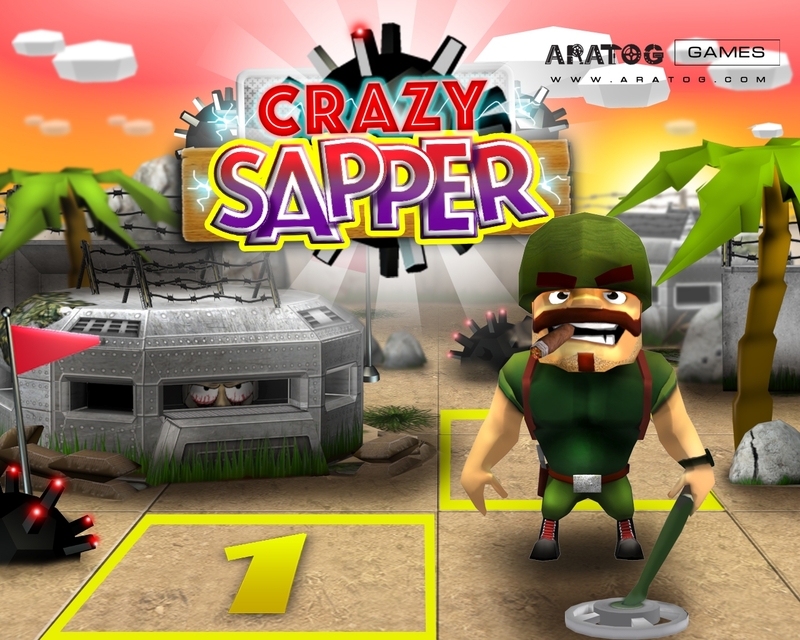 Attention to all Russian-speaking fans of Crazy Sapper! 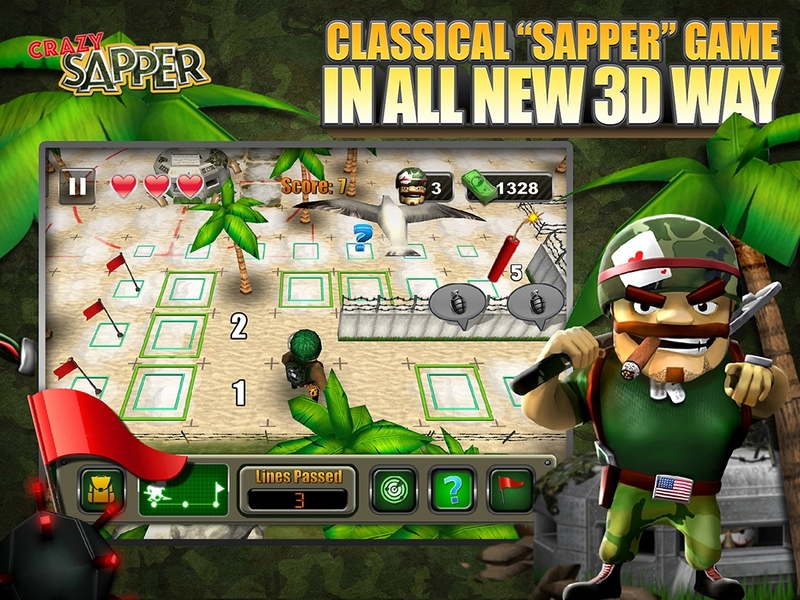 enjoy brand new Russian version of "Brave sapper 3D" for iOS, Android and PC! We are pleased to invite beta testers to the game of Astro Lords: Oort Cloud. Astro Lords: Oort Cloud is a massively multiplayer 3D space strategy developed for Web and PC that provides the player with wide range of possibilities such as construction, capturing the asteroids, exploration, pirate raids, real-time space battles, mining for resources, obtaining artifacts, joining clans and many other things. The purpose of beta testing is to make final corrections with the help of many users, and also to check interactions at the Arena and within the Oort Cloud. We will temporarily open free registration at http://astrolords.com/landing, which will be closed after we have gathered a few thousand active players. During beta testing period, we do not accept any payments. Besides, during this period, we are launching a competition to find a winner who collects as much tritium as possible. The winner and finalists will be rewarded with valuable prizes and souvenirs. 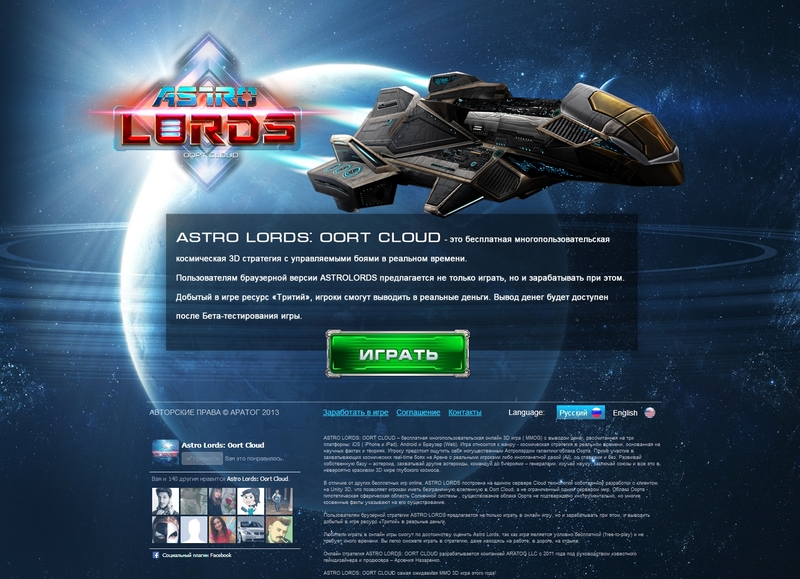 In Russian-speaking countries, the game of Astro Lords will be available for different platforms. This means that the owners of various devices will have the possibility to interact with the world of Astro Lords: Oort Cloud having only one account, and using different platforms such as Web (any browser), PC (clients for Windows, MacOs, Linux), iOS (iPhone, iPad, iPod touch) and Android. 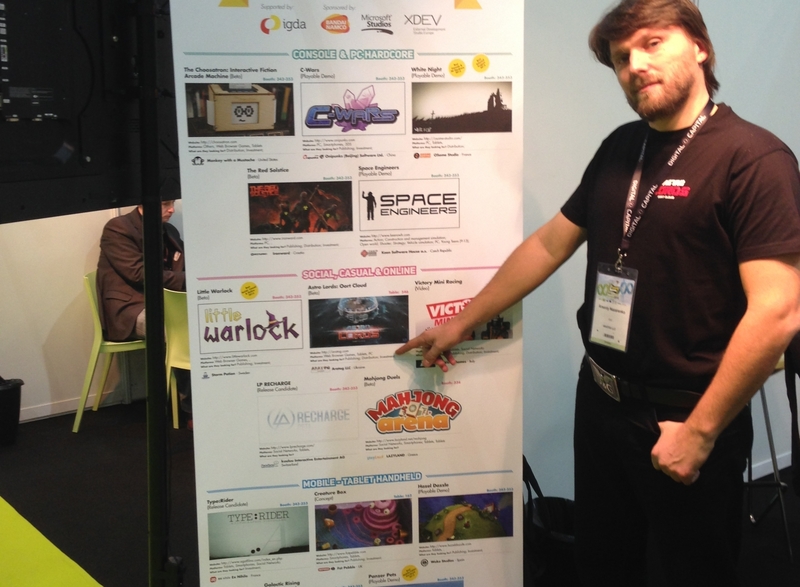 Astro Lords: Oort Cloud was highly appreciated at big European game conferences and it was selected as a finalist at ‘Selected Projects’ competition at ‘Game Connection Europe’, December 2013, in Paris. 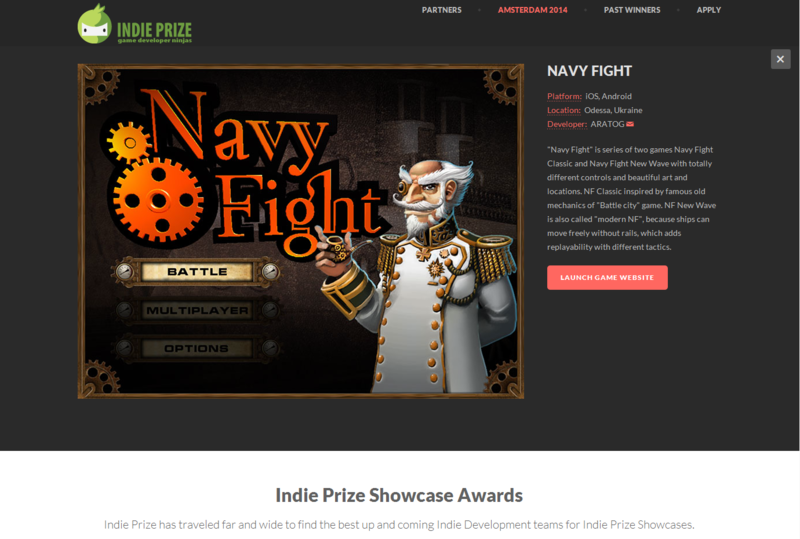 It has also been selected as one of three best games in the ‘Best Game for Browser’ category at ‘Indie Prize Showcase’ exhibition at ‘Casual Connect Europe’ 2014 in Amsterdam. 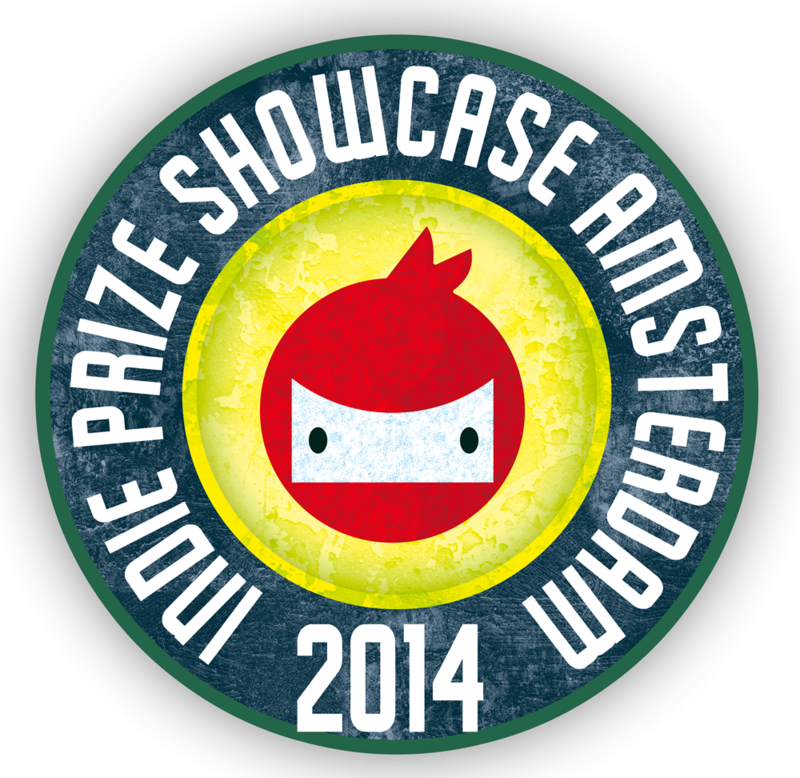 Two our games: Astro Lords and Navy Fight were chosen and invited for Indie Prize Showcase Amsterdam during Casual Connect Europe 2014! So everyone is invited, come and meet us in person! We are glad to announce that two our games: Astro Lords and Navy Fight have been choosen and invited to Indie Prize Showcase Amsterdam during Casual Connect Europe 2014! «Astro Lords: Oort Cloud» - is Next-gen 3D cross-platform MMO space-strategy game with combat management in real time, based on cutting edge scientific theories. "Navy Fight" is seria of two games with totally different controls and beautiful art and locations. NF Classic inspired of famous old mechanics of the "Battle city" game. NF New Wave we also call as "modern NF", because ships can move freely without rails and it allows to play with many tactics. The Indie Showcase is not only a chance to display our games to a lot of publishers and industry gurus but it is also a great opportunity to meet and spend time with other developers from around the world. The showcase starts at 10am on February 11th and will be open everyday till 13th from 10am till 5pm. Come and play our games! ASTROLORDS: Happy Holidays and Astro Lords Backer's avatars. 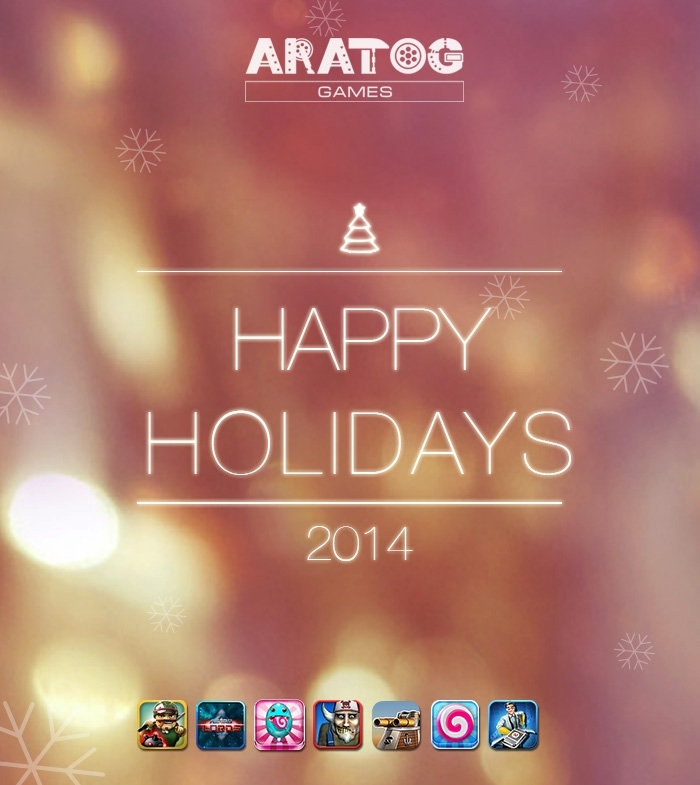 We, the Astro Lords team, with the warmest regards, wish you a Happy Holidays 2014! May this Christmas be bright and cheerful and may the New Year begin on a prosperous note! We, the Astro Lords team, with the warmest regards, wish you a Happy Holidays 2014! Happy Holidays 2014 from AstroLords! We do really appreciate your support and have created a special avatars "I backed AstroLords" for your Kickstarter profiles. Just choose the avatar which you like, save it to your computer and then upload to your avatar at Kickstarter profile! We hope that you'll like it! If you want something special for your avatar, just let us know and we'll create that exactly for you! Dear collegues, partners and players! We are glad to wish you a Merry Christmas and a Happy New 2014 Year! 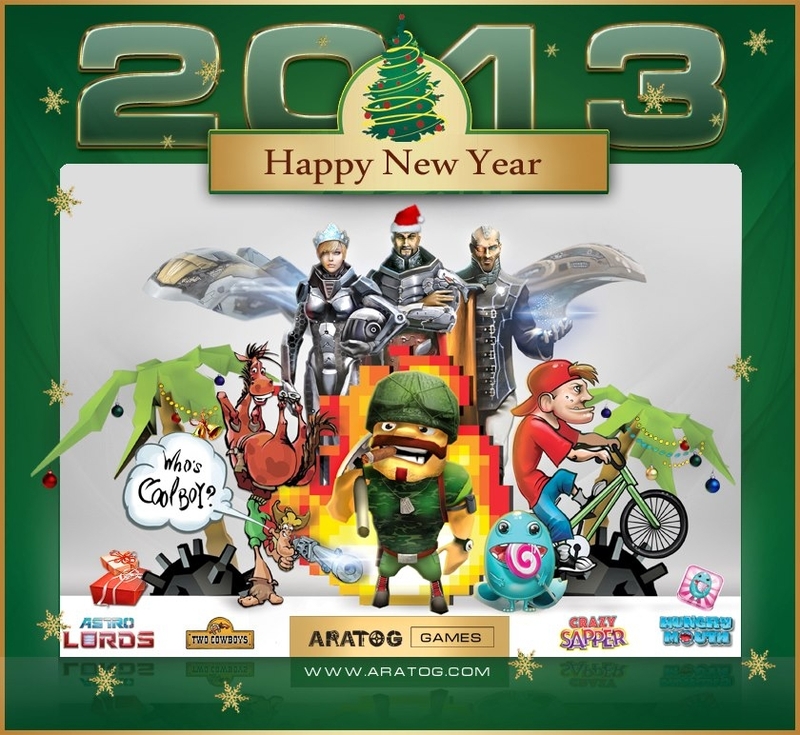 We, the ARATOG team, are glad to wish you a Merry Christmas and a Happy New 2014 Year! 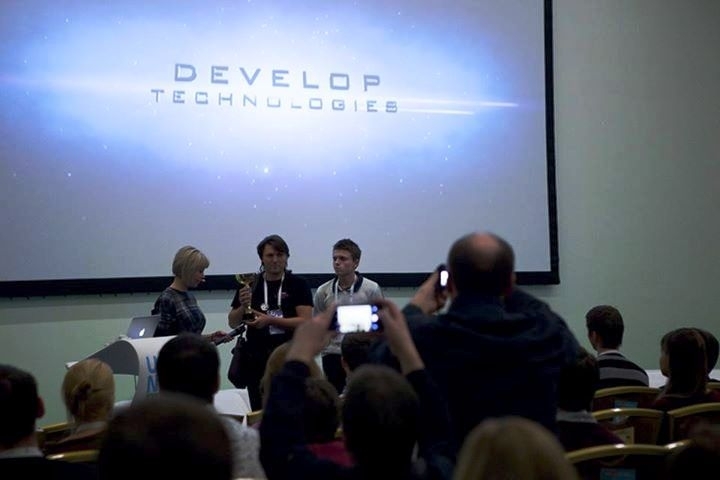 This weekend 7-8 December, we participated at Kyiv gamedev conference DevGAMM 2013, which took place at RUS Hotel. This year the conference broke all possible records! It was attended by more than 1300 participants! 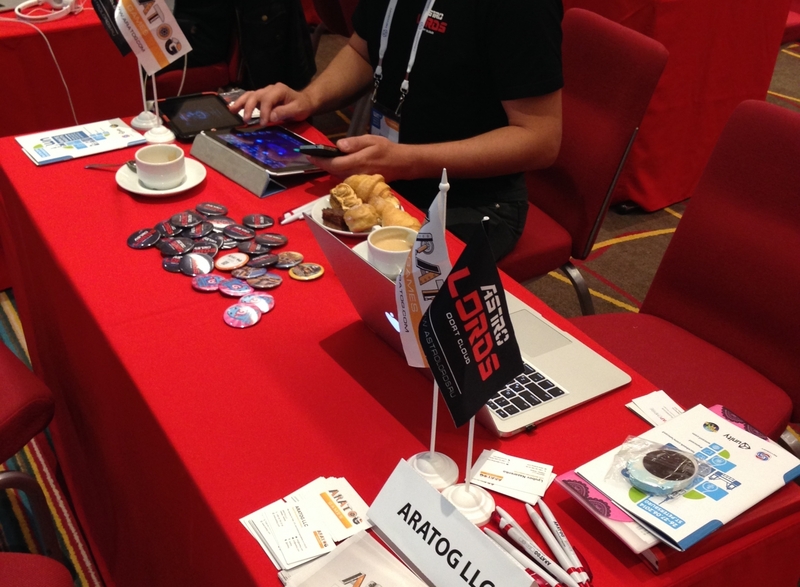 ARATOG was one of Silver sponsors of DevGAMM 2013 with its table S4 located at Sponsors hall on the 1st floor. Our main goals for this event were to meet with our current partners and meet new ones and of course to bring our key team people to lectures of the conference. 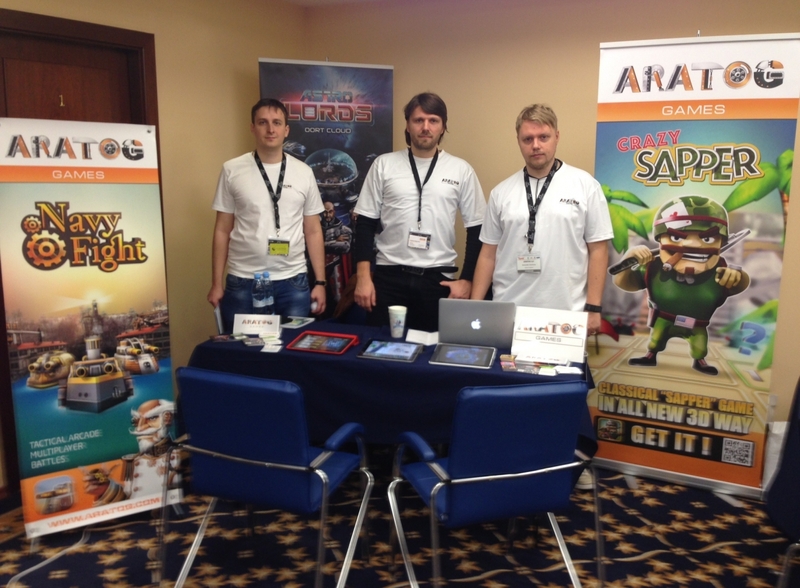 This weekend 7-8 December, we participated at Kyiv gamedev conference DevGAMM 2013, which took place at RUS Hotel. This year the conference broke all possible records! It was attended by more than 1300 participants! 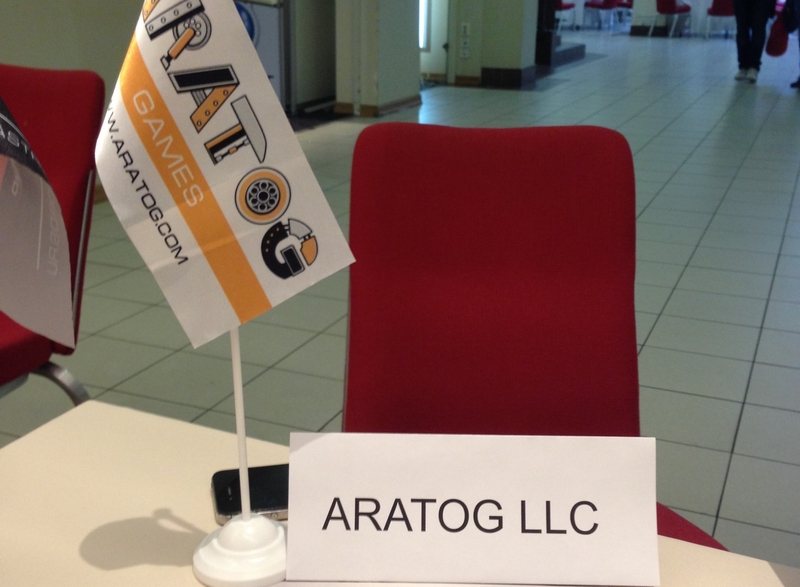 ARATOG was one of Silver sponsors of DevGAMM 2013 with its table S4 located at Sponsor’s hall on the 1st floor. Our main goals for this event were to meet with our current partners and meet new ones and of course to bring our key team people to lectures of the conference. Also, our game Crazy Sapper was invited to attend premiere event, GAMM:Play Game Showcase, and everyone could play it at December 7 from 15:00 till 18:00 at table A1! 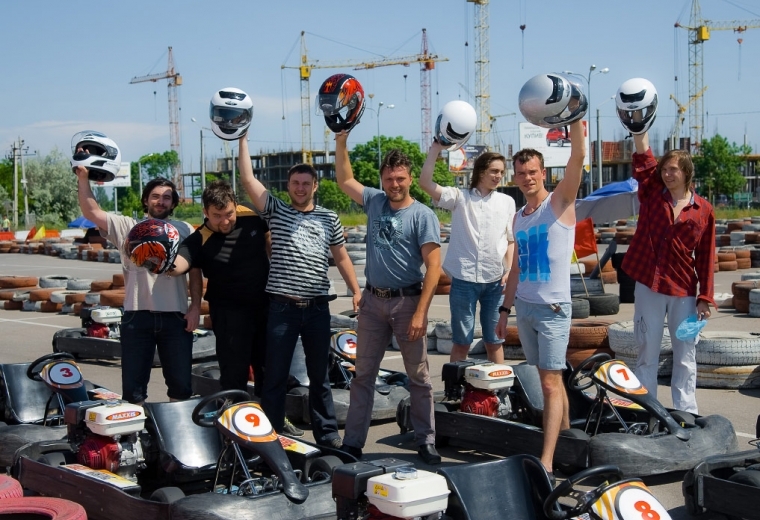 We had a lot of fun during DevGAMM, networking, new business meetings etc! What was really cool – to face with people, who really play and love your games! And more our games come alive soon! 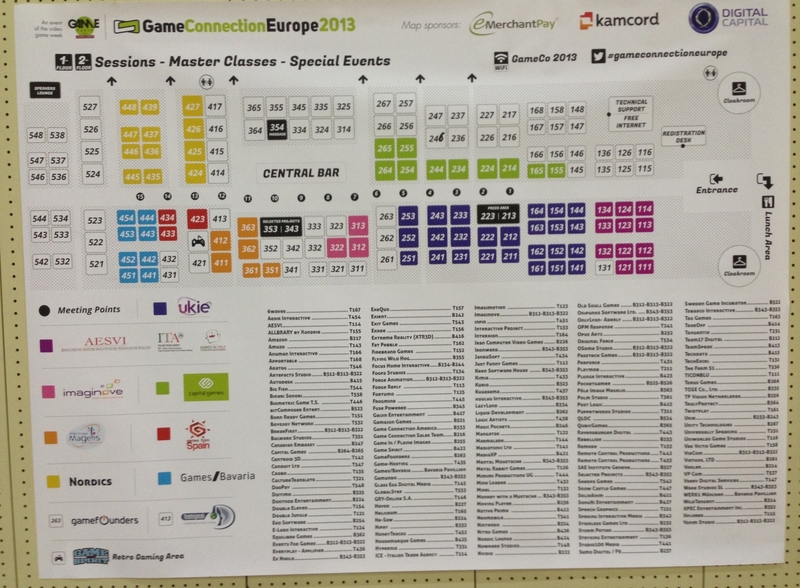 Back from Game Connection Europe 2013! Game Connection Europe 2013 took place December 3-5 at Les Docks de Paris, France. In total over 1627 industry professionals from more than 51 countries worldwide gathered in Paris, to do business, grow networks and share knowledge with the best in the business. ARATOG was a Table Exhibitor with its table on main Alley number 546. We made more than 40 meetings during 3 days! Thats amazing! The most profitable conference for us is Game Connection! 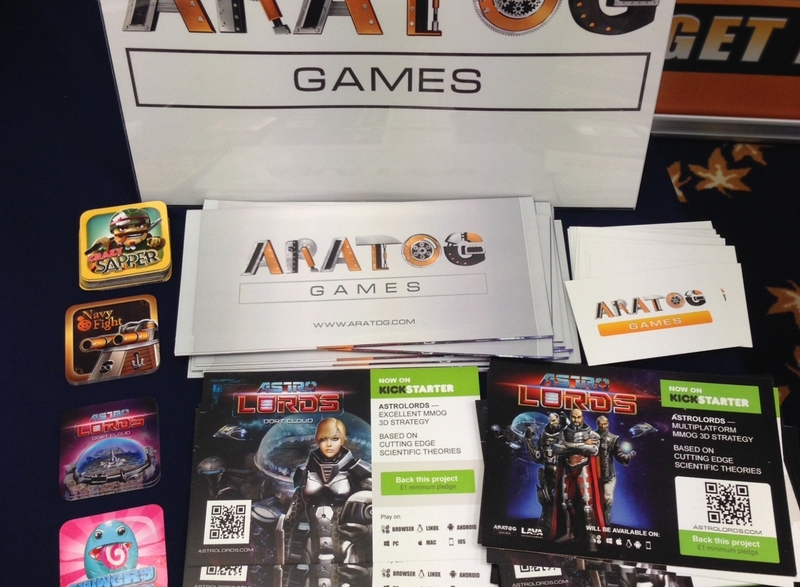 ARATOG was a Table Exhibitor with its table on Main Alley number 546, easily recognizable because of bright AstroLords roll up banner! We made more than 40 meetings during 3 days! That’s amazing! The most profitable conference for us is Game Connection! Also, our main project – Sci-fi MMOG Astro Lords: Oort Cloud was nominated for Selected Projects awards at “Online” category, whick was held on Tuesday 3rd December, from 10 am to 11h50 am. Our CEO and Executive Producer Arseniy Nazarenko made a great pitch presentation of AstroLords and it attracted many famous and huge publishers. The video trailer of AstroLords gameplay was shown on the biggest conference screen on main alley during all three days of event. Our main goal for Game Connection was to find publishers for PC, Web and other platforms for AstroLords or funding to development of our other games. And we got a success! We are going ot St.Petersurg this Thursday! 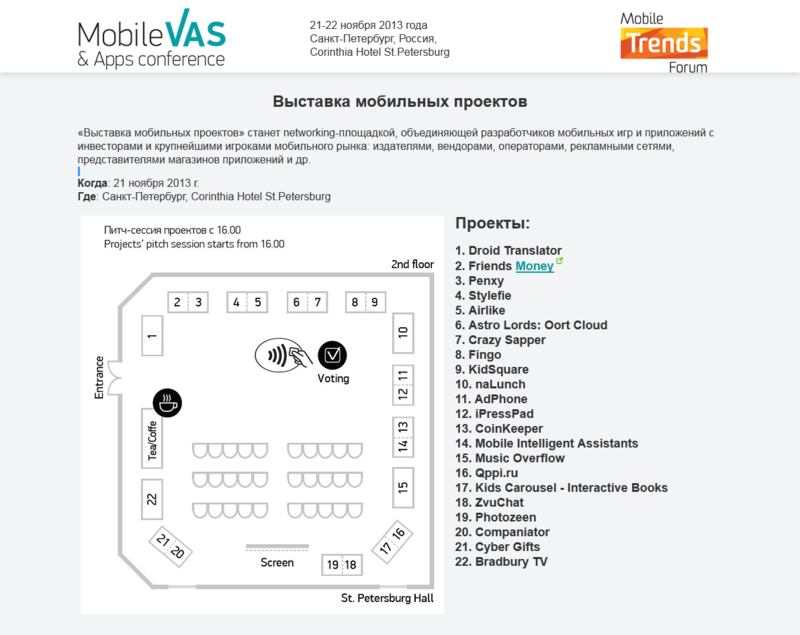 Two our games Astro Lords: Oort Cloud and Crazy Sapper were choosen for Mobile Projects Showcase at Mobile VAS & Applications Conference and Mobile Trends Forum! Which will be held this Thrusday at 21st November 2013 at the 2nd floor of Corinthia Hotel, St. Petersburg, Russia. 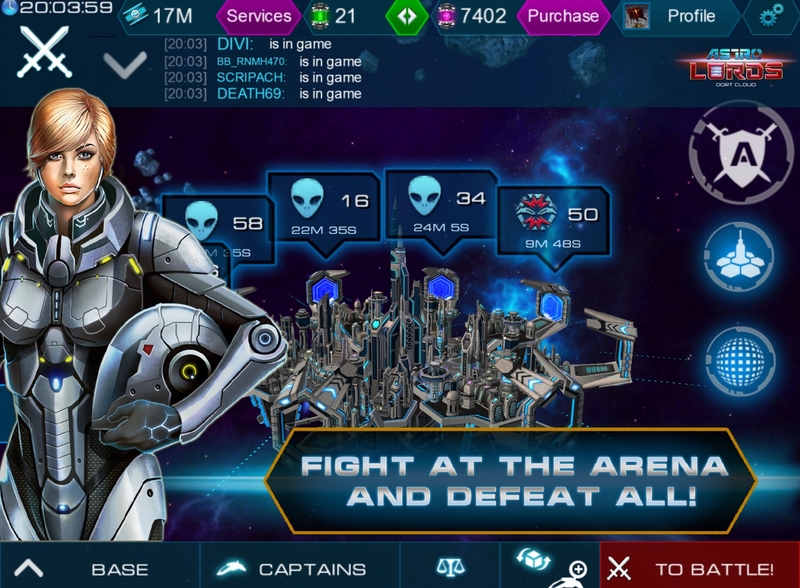 Astro Lords is cross-platform MMOG 3D strategy with combat management in real time. Crazy Sapper is puzzle iOS game in 3D based on MineSweeper gameplay. This is 10th conference. Every year the Mobile VAS & Apps Conference draws over 500 participants from 20 countries or more. For many years it has remained a magnet for the mobile industry’s top professionals and analysts, successful startups, cellular companies, vendors, telecom holding groups, investment companies, mobile application developers (including creators of the latest best-selling apps), and the leading general and specialized business media. The Mobile Projects Showcase is a networking site where mobile game and app developers will meet investors and major mobile industry players: publishers, vendors, operators, advertising networks and app stores. 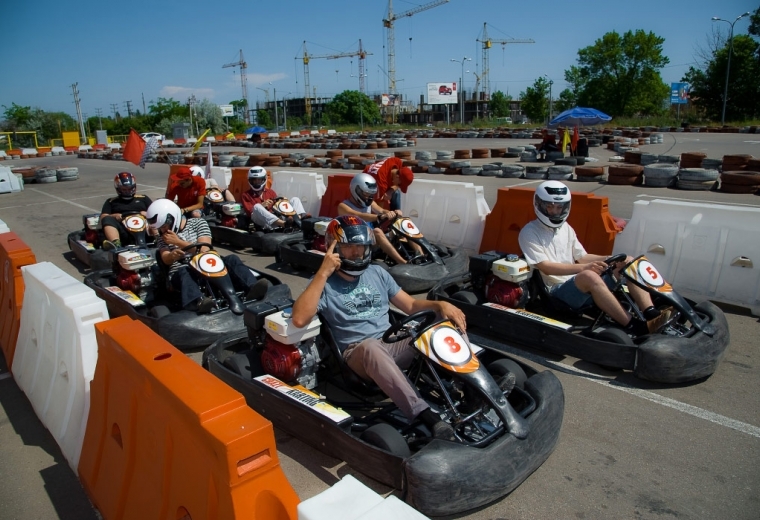 The exhibition will be attended by: Skolkovo, Ingria, Silicon Valley and Momentum Accelerator, Google, Sistema, Microsoft, Technocup, Mail.ru, i-Free, Konami, Nevosoft, Rovio, Konstsntin Sinushin, Pavel Cherkashin, Gleb Kaplun. The list of speakers includes companies such as Samsung, MTS, Beeline, Megafon, Rostelekom, DNA Partners, Dentsu, and others. Our tables are number 6 and number 7 according to this map. We would be glad to meet our partners and friends there! AstroLords nominated for Selected Projects! We are proud to announce that our game "Astro Lords: Oort Cloud" nominated to Selected Projects competition at "Online" category during Game Connection Europe conference in Paris! 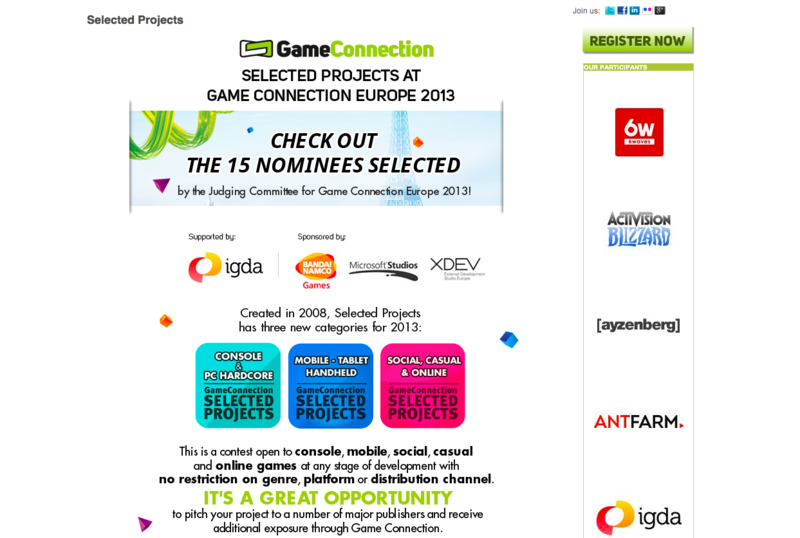 The IGDA also supported the Selected Projects program by helping to spread the buzz around the world. The great surprise for us was personal congratulation with Selected Projects nominee from Eric Lacroix, who visited us during Casual Connect conference in Kyiv last week. We are proud to announce that our game - "Astro Lords: Oort Cloud" nominated to Selected Projects competition at "Online" category during Game Connection Europe conference in Paris! 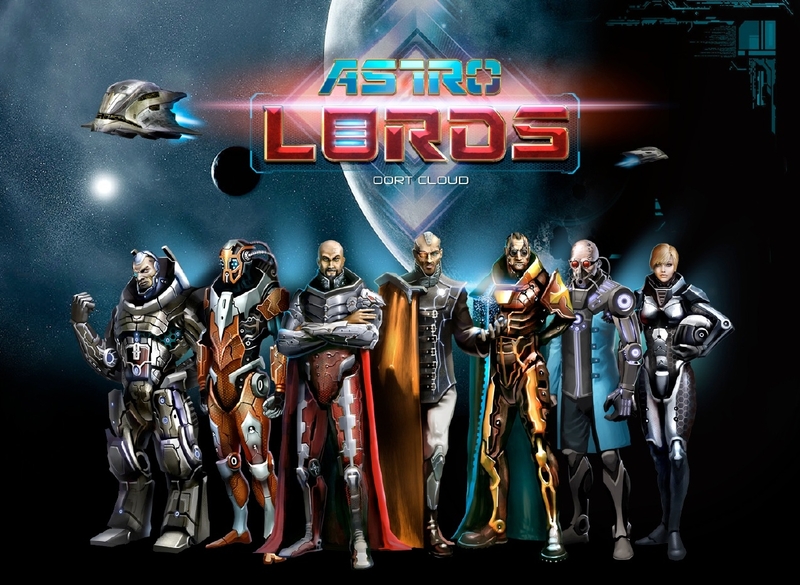 Astro Lords is Sci-Fi 3D strategy Massively Multiplayer Online Game (MMOG). Game built on distributing technologies with Cloud support, client on Unity 3D, which allows putting game in various platforms, but primary are Web (PC), iOS and Android. Mass of players live in hypothesized Oort Cloud. Players build factories and mines on own asteroid, research science, spy and attack asteroids of other players, loot and sabotage, explore the Oort cloud for ancient artefacts and resources. Fight at Arena in real-time combats, which based on unique fight gameplay combined turn-based and real-time types of gameplay. Be worthy to become a real ASTROLORD! 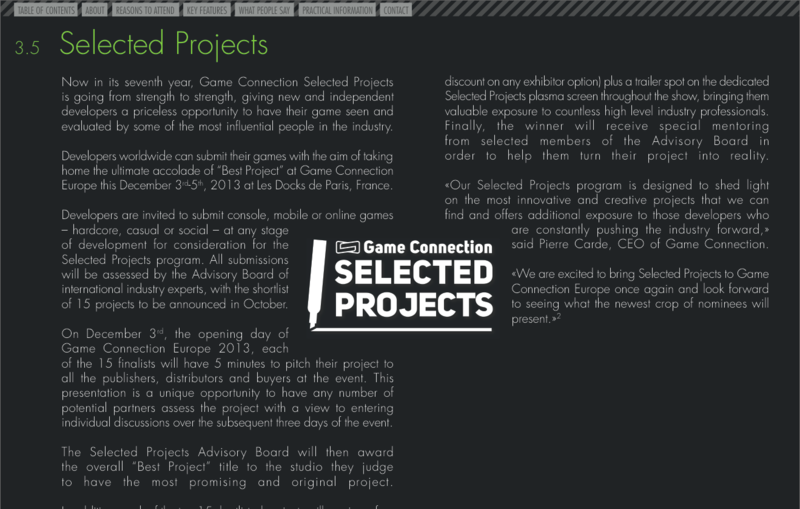 The IGDA also supported the Selected Projects program by helping to spread the buzz around the world. 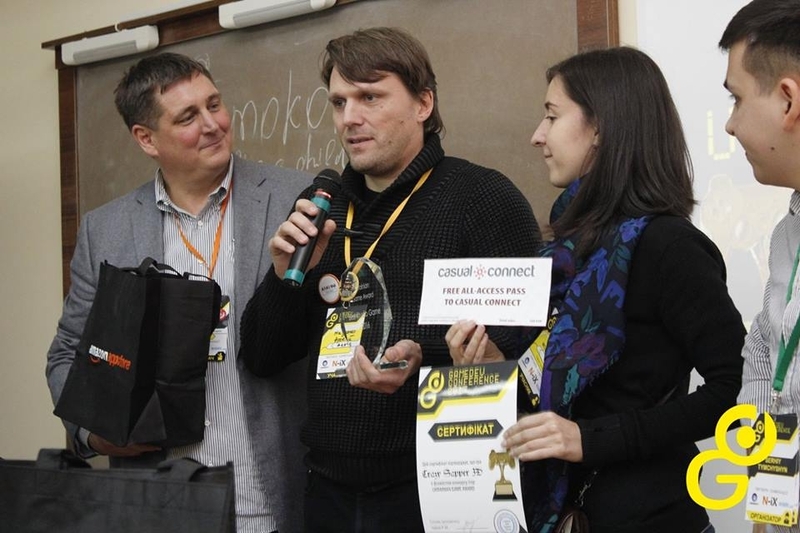 The great surprise for us was personal congratulation with Selected Projects nominee from Eric Lacroix, who visited us during Casual Connect conference in Kyiv last week. Eric is wonderful and inspired person and we are looking forward to present AstroLords in Paris! Game Connection Europe is the largest european conference in game industry. Since 2001 Game Connection has been the place to be for video games professionals. Three times a year – in Europe, in the US and in Asia – key players from the industry gather to meet, do business together, connect with new prospects and socialize in a dynamic environment. 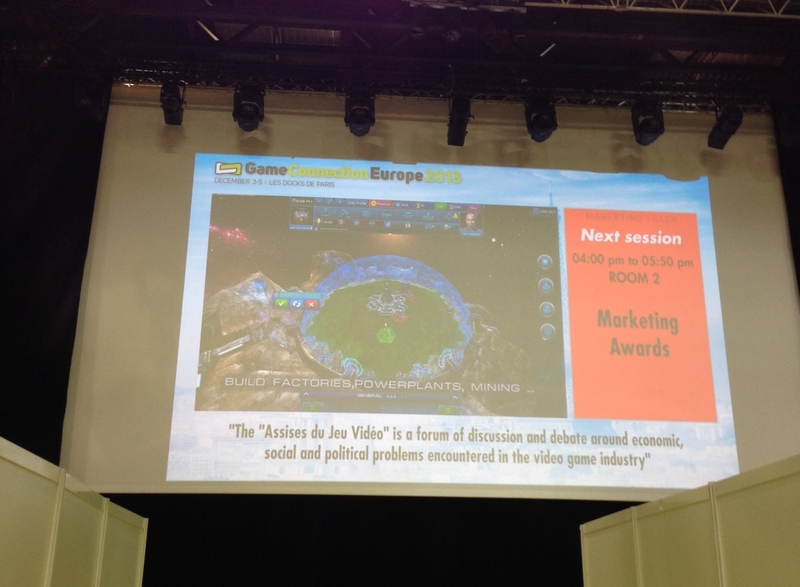 Game Connection Europe 2013 will be held in the City of Lights: Paris, December 3-5, 2013. The event will be located at Les Docks de Paris, 32 Rue Proudhon, 93210 La Plaine Saint Denis. Selected Projects conference is set to open the event on Tuesday 3rd December, from 10 am to 11h50 am. 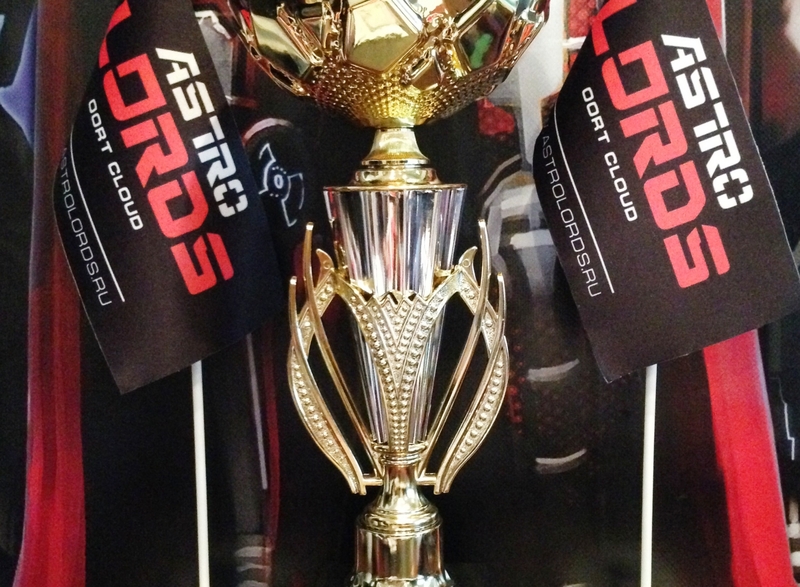 Awards to winners will be at last day, Thursday 5th December, and we do hope AstroLords will win! Casual Connect Kyiv 2013 was held at its 8th annual last week on October 23rd-25th at RUS Hotel. But it was the first time of ARATOG games team to attend Casual Connect event. 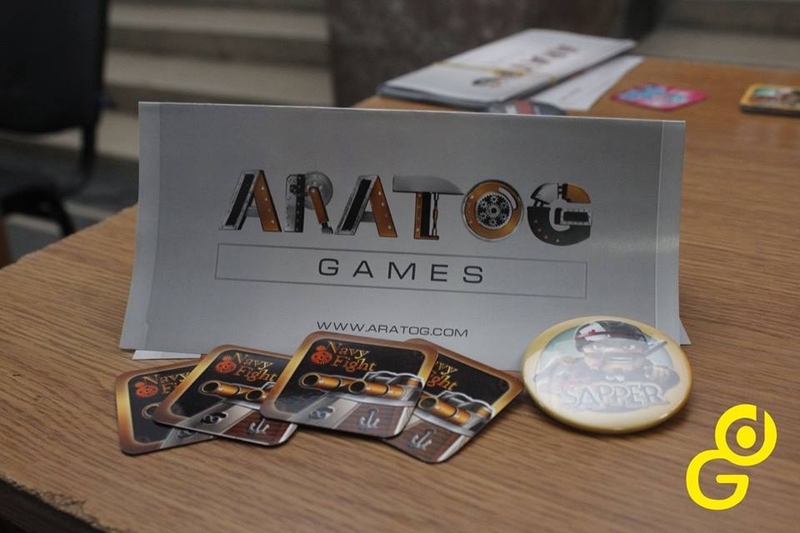 ARATOG LLC was one of sponsors for CCKyiv 2013, we decided to take Bronze sponsorship package with a table, to have possibility to talk with partners at our meeting place and to contribute to popularity of game development. Casual Connect Kyiv 2013 was held at its 8th annual last week on October 23rd-25th at RUS Hotel. But it was the first time of ARATOG games team to attend Casual Connect event. 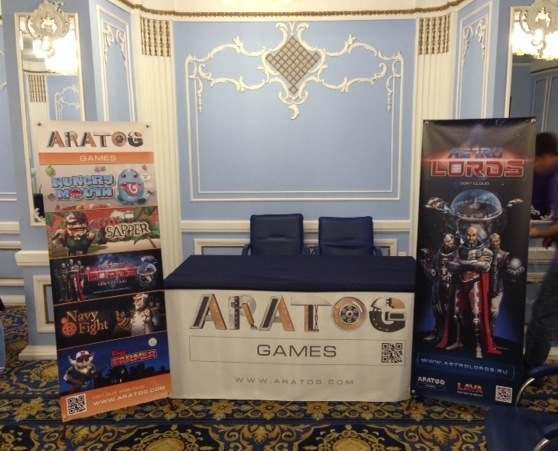 ARATOG LLC was one of sponsors for CCKyiv 2013, we decided to take Bronze sponsorship package with a table, to have possibility to talk with partners at our meeting place and to contribute to popularity of game development. It was very exciting to see so much specialists in game development and game publishing business in one place, we have made a lot of meetings and get know new popular services and tools in the industry. Our table #4 was located on the second floor at Azure hall, our bright banners of projects attracted many people to meet us and get know more. It was great three days in Kyiv of networking and business cooperation. Our main goal for this event was to meet with our current partners and meet new ones. And for sure we were glad to present our upcoming projects, as well as projects in development. Our title Crazy Sapper, a puzzle game designed on Unity3D, is ready for release on iOS, and of course our gem - Astro Lords: Oort Cloud- huge MMO 3D strategy game in sci-fi, which is on beta stage already and got leading publisher for iOS and Android, will come alive soon! We would like to thank to Casual Games Association for such wonderful conference and well organisation of it, personal thanks to Carl Quinton and Lea Marie Hester! It was professional, it was fun! We will come again! Meet ARATOG at Casual Connect Kyiv next week! Casual Connect is produced by the Casual Games Association and is the premiere event for the casual games industry with over 4,500 professionals attending Casual Connect each year. Casual Connect brings together the most talented and knowledgeable experts in the casual gaming field to further the casual games industry with the best of networking and learning. Lectures at Casual Connect are programmed to focus on cutting edge topics in the casual games space. 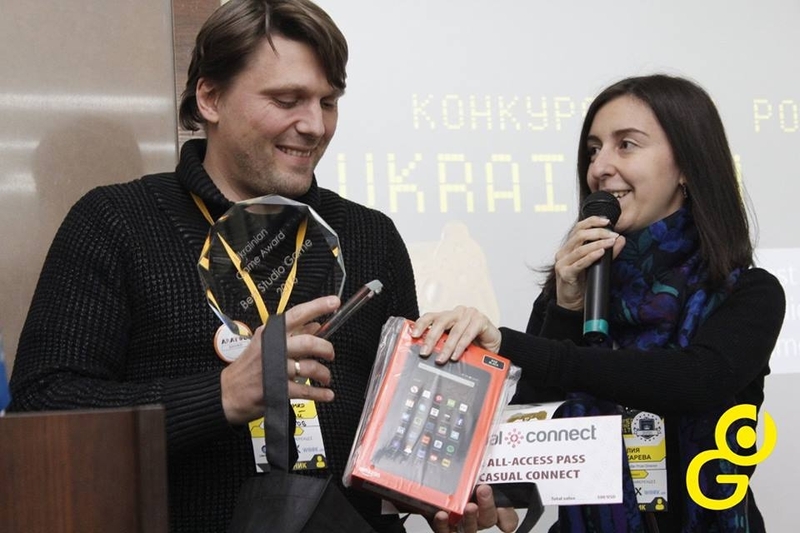 On October 23 - 25 2013, over 850 industry professionals will come to Kyiv for the eighth annual Casual Connect in Ukraine. To set up a meeting with us, please use following link http://kyiv.casualconnect.org/meetings.html#aratog or mail us via Contacts. Everyone who will come to our table will be awarded with a present- beautiful magnets with our games! Presents are limited, so once you arrive to Casual Connect, do not forget to come and see our stand. We are looking forward to meet at Kyiv! Great news! Site of ARATOG LLC was fully re-designed!Meet bright and very beautiful new style! Logo, presentations, other promo materials were totally re-designed in new bright style. Check it up! Great news! Site of ARATOG LLC was fully re-designed!Meet bright and very beautiful new style! Logo, presentations, other promo materials were totally re-designed in new bright style. Events added! Now you can always see where and when you can meet us a person! List of events, we did attend or plan to attend, with logo, dates and links. Now you can see presentations of our projects right on the PORTFOLIO menu. We would be happy to hear your feedbacks and comments! Great games are coming! Stay tuned! 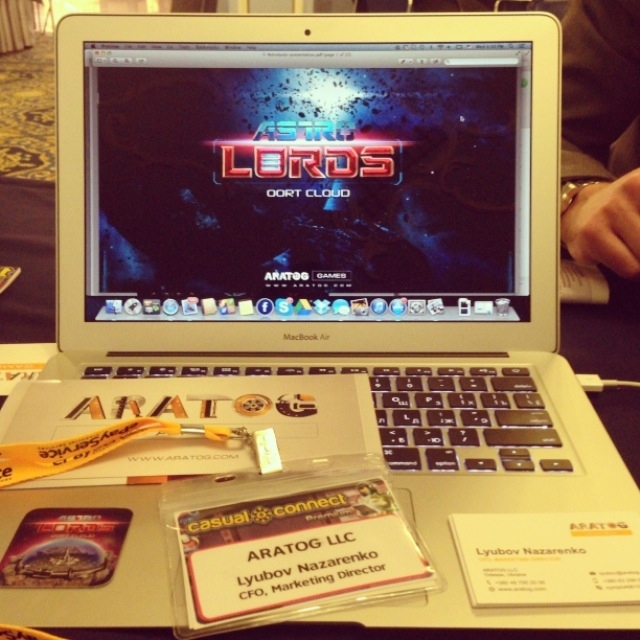 ALPHA of MMOG Astro Lords has been started! Dear alpha-testers, enjoy your play and have a lot of sucessful battles! 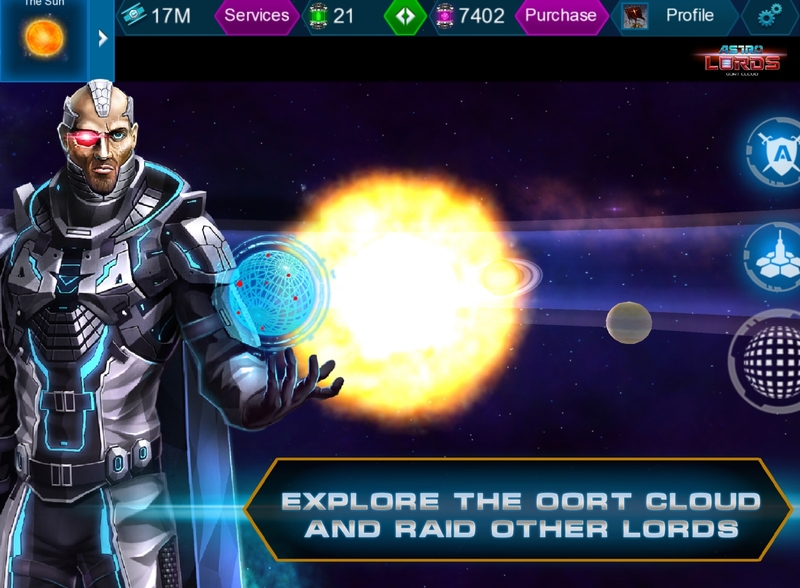 ASTRO LORDS: OORT CLOUD is Sci-Fi Massively Multiplayer Online Game designed for three platforms: PC/Web, iOS and Android, built on distributing server technologies with Cloud support and Mongo DB, client on Unity 3D engine. White Night 2013 took place in St.Petersburg on June 27th-28th. This was the second time the conference was held at summer (in February as the Winter Nights and in June as the White Nights) and it attracted more than 800 influential professionals and developers in the mobile game industry. Industry-leading companies like Supercell, Rovio, Wooga, Chillingo, Facebook, Big Fish, FishLabs, PlayFirst, Google, Samsung, Flurry and many others have attended. ARATOG main goal for the conference was to meet with our current partners as well as present our new products to publishers. Which are: Crazy Sapper- puzzle game based on Window’s minesweeper gameplay; Astro Lords- sci-fi MMOG strategy game for 3 platforms, Navy Fight – multiplayer arcade simulation game. The conference was organized very professionally, which allowed us to have a lot of useful business meetings and make new business contacts. It was really wonderful two days of Conference at St. Petersburg. Piter is wonderful city, and of course white nights were awesome! If you didn’t have the chance to meet us at the White Nights 2013 in St.Petersburg this summer, we are certainly open to hearing from you via email. 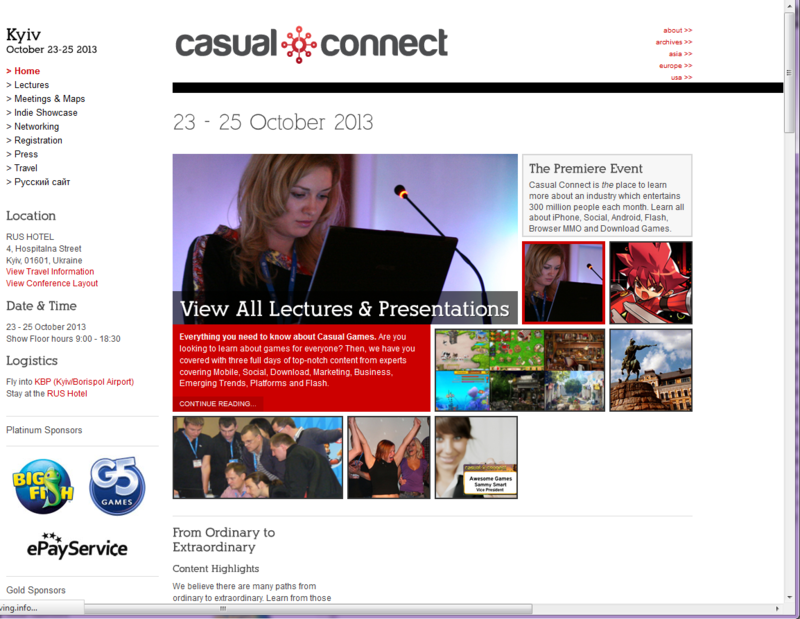 Our next event will be Casual Connect Kyiv , that will take place on October 23rd-25th, 2013. 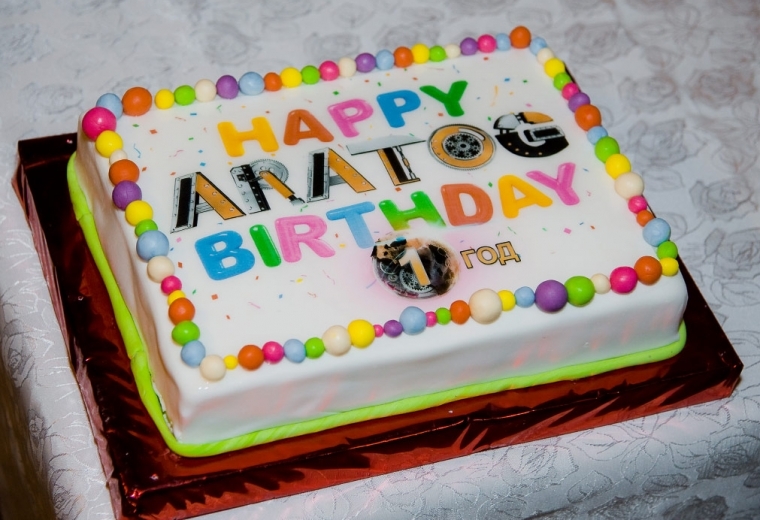 1 year anniversary ARATOG LLC! Back from GDC America and Game Connection 2013. We are happy and tired. We made a lot of meeting, that was a really fast and gard 3 days of the conference at game Connection America 25-27th of March, which held at Sir Francis Drake Hotel. 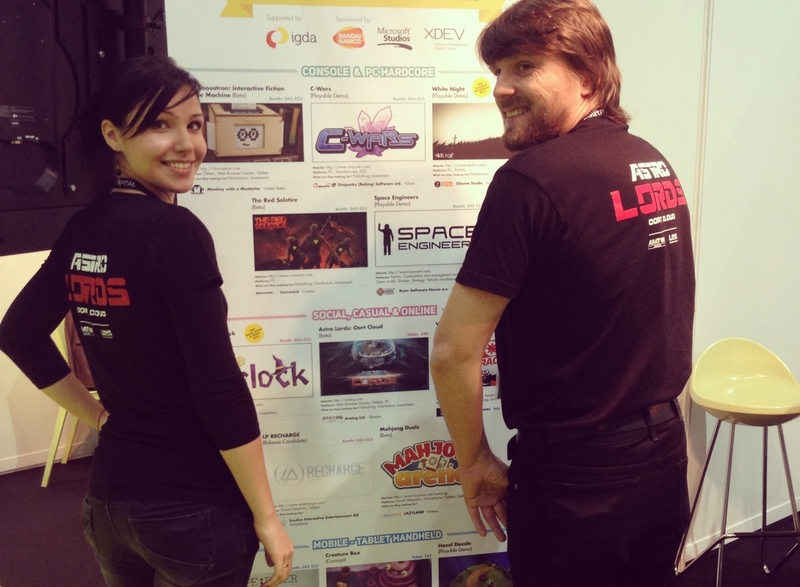 Starting from 25th of March we also attended GDC America 2013. WСѓ were fully impressed by its huge stands and halls and its poplularity! Thoudands and thousands of people were attend! Wonderful! 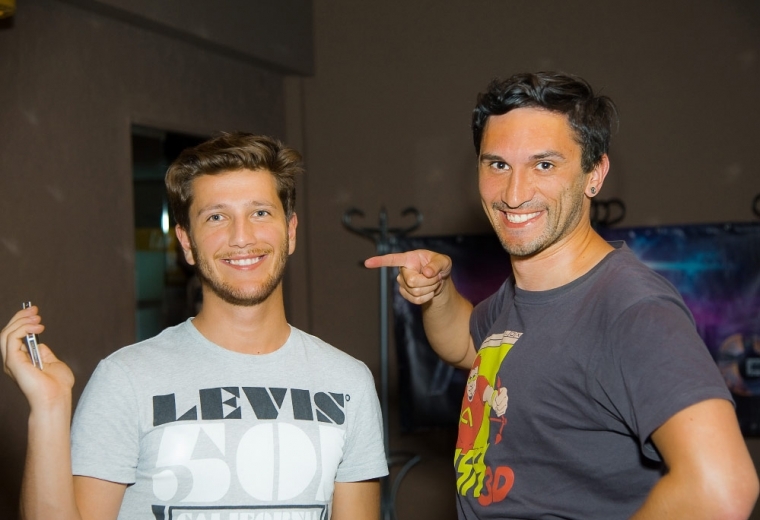 We have met a lot of talented and famous in gamedev industry people! Look forward to full post press-release! 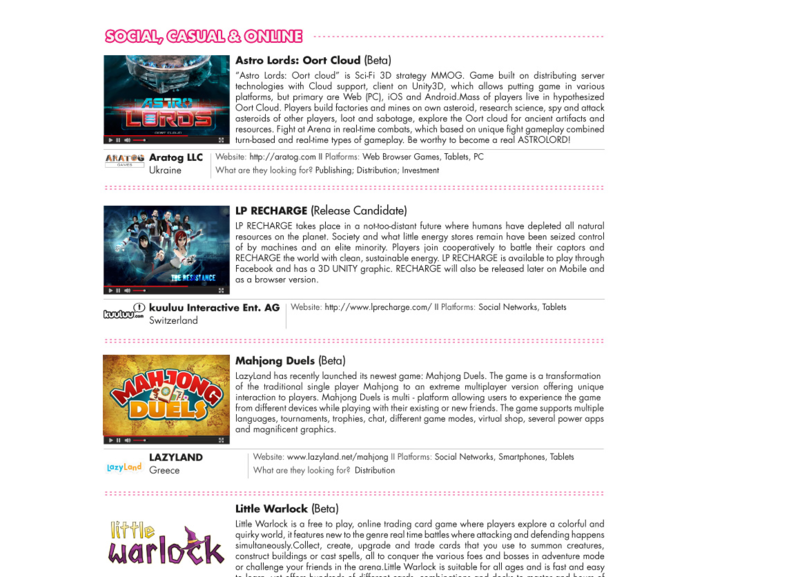 ARATOG LLC will attend Game Connection America 2013 and GDC 2013 conferences in San Francisco, USA at 23-27th March. New game started- Crazy Sapper! 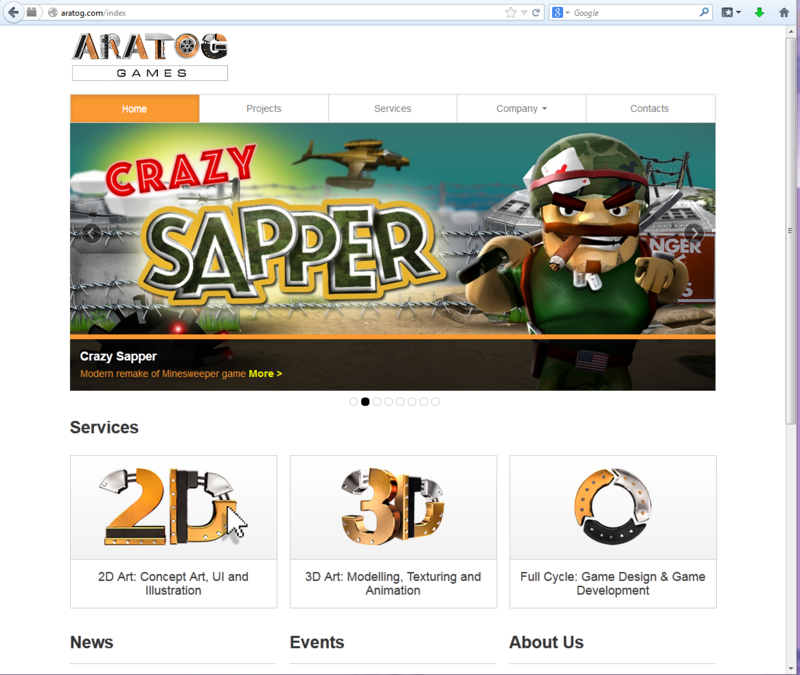 Aratog LLC announced a start of development of new casual mobile game – Crazy Sapper. If you are a Minesweeper fan then you will like our new game "Crazy Sapper" - modern remake of the classic minesweeper based on original idea. 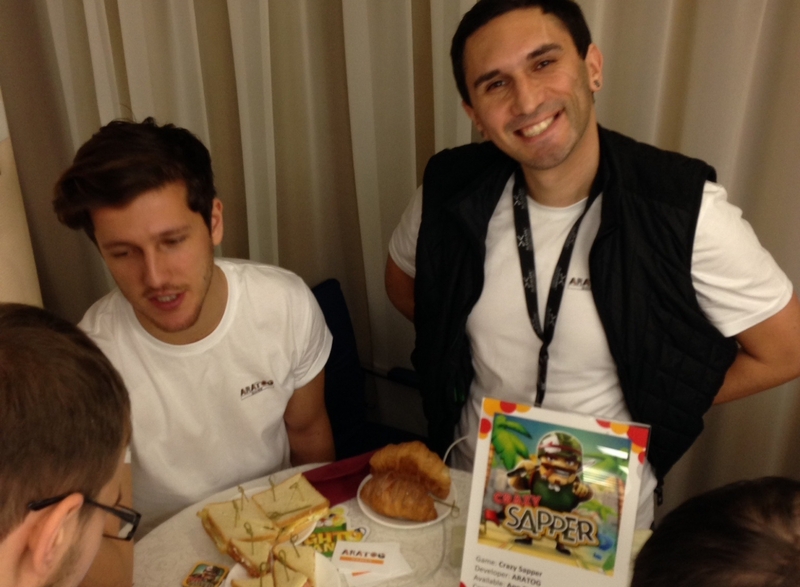 Crazy Sapper is perfect game for people who love to solve logic puzzles! Keep updated! Aratog gets a gift - Star! Registered at catalogue of the “Space-Earth” starry sky by J.S.C. 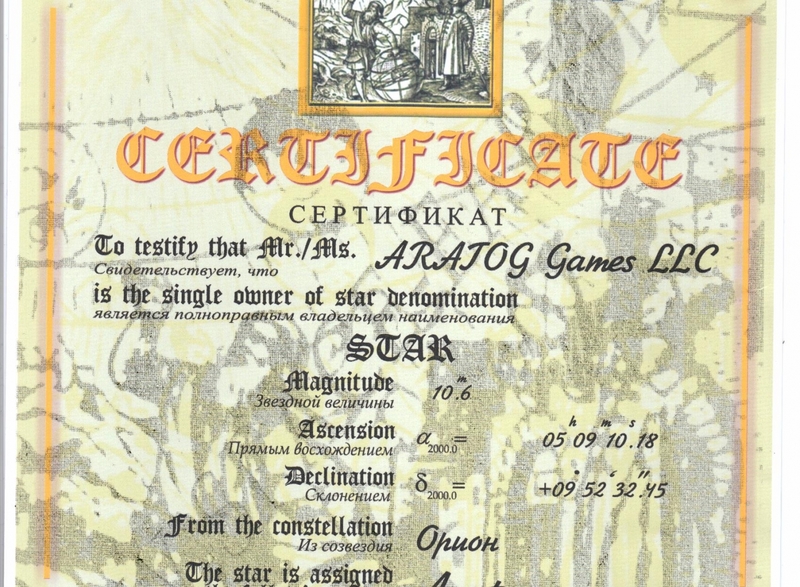 “Space-Earth”, Moscow, Russia, we got a Certificate to testify that ARATOG LLC is the single owner of star demonination Star: Magnitude 10.6 from the constellation Orion . Aratog gets a gift – a Star! Registered at catalogue of the “Space-Earth” starry sky by J.S.C. 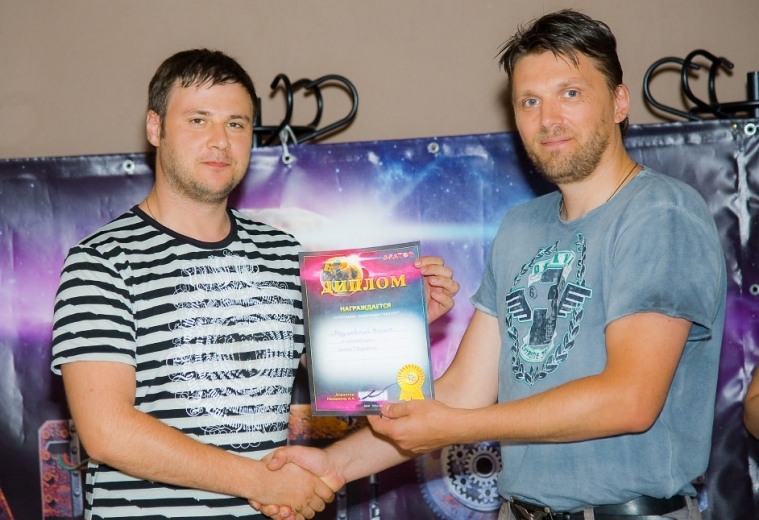 “Space-Earth”, Moscow, Russia, we got a Certificate to testify that ARATOG LLC is the single owner of star demonination Star: Magnitude 10.6 from the constellation Orion . The star is assigned the following name: Aratog Games # 1323 Serios 10. 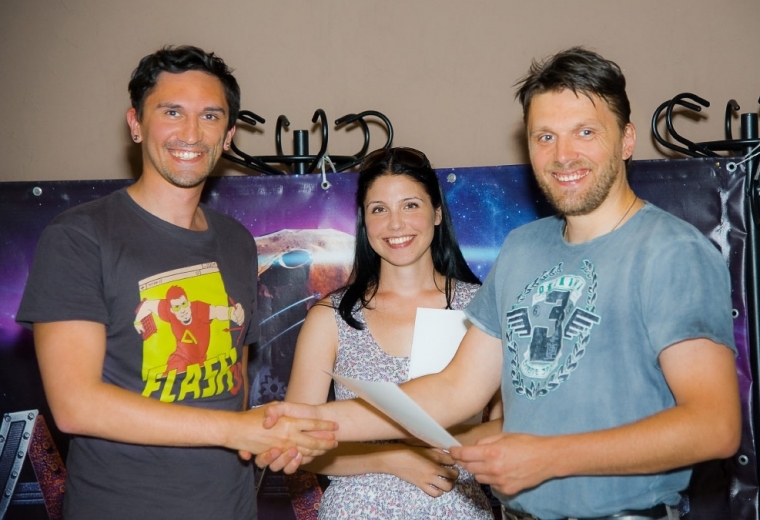 Aratog is the first company who get own star at Orion constellation! We wish you a wonderful new year filled with abundance, joy, and treasured moments. Let 2013 year to be your the best year ever! We look forward to working together with new and current partners in this 2013 new year and reach sucess! Be the best! Be with us! 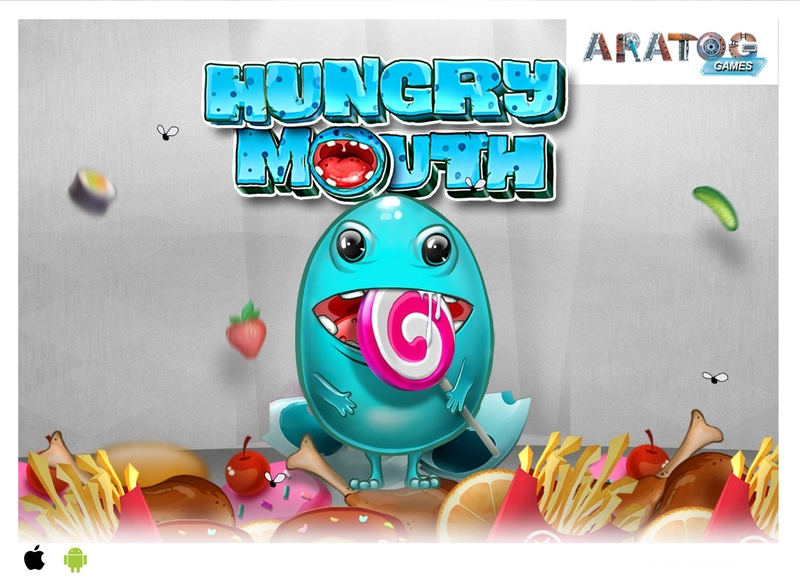 Debut game Hungry Mouth HD released! 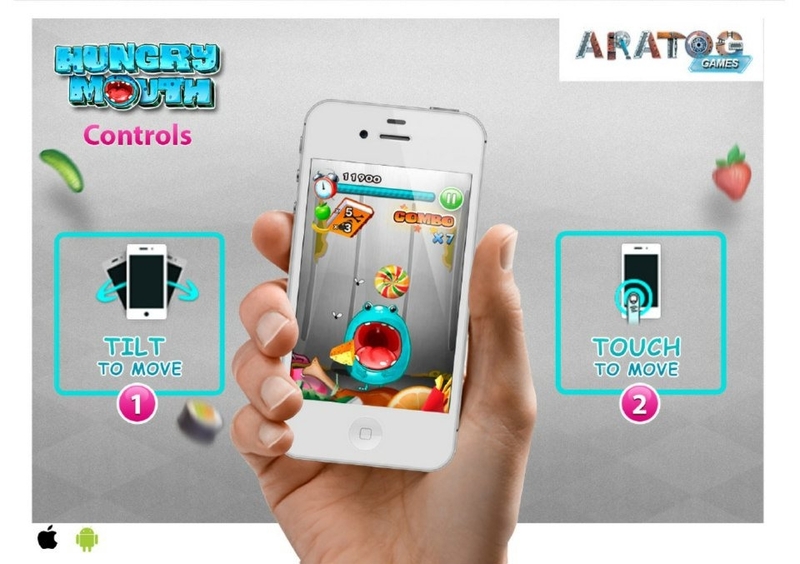 Debut game of Aratog LLC Hungry Mouth HD version released on AppStore for 0.99$! 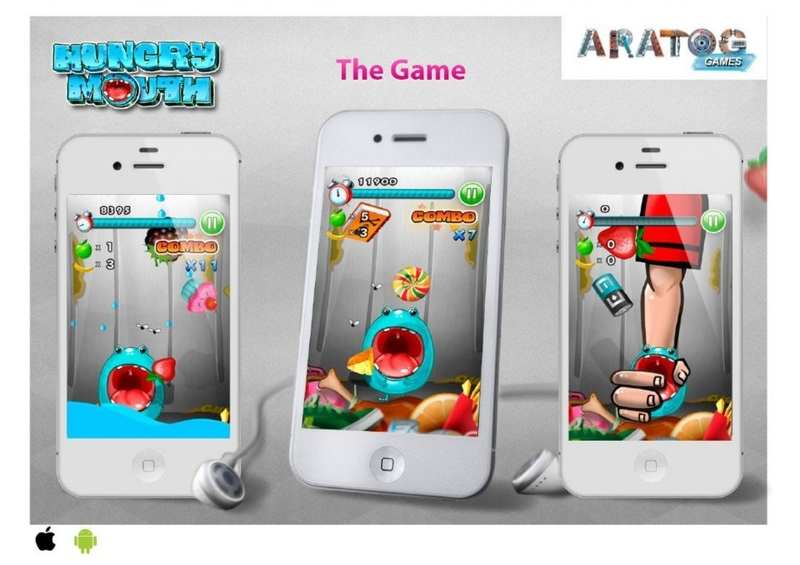 Game developed on Unity 3D engine for iOS and Android platforms. 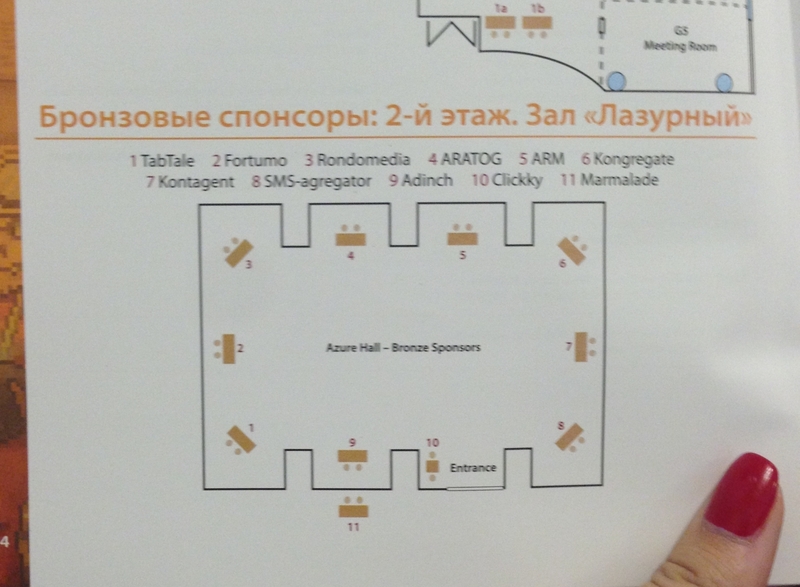 We are happy to announce that ARATOG LLC will attend FlashGamm Conference 2012 in Kyiv 8-9 Dec. at Hotel Rus. 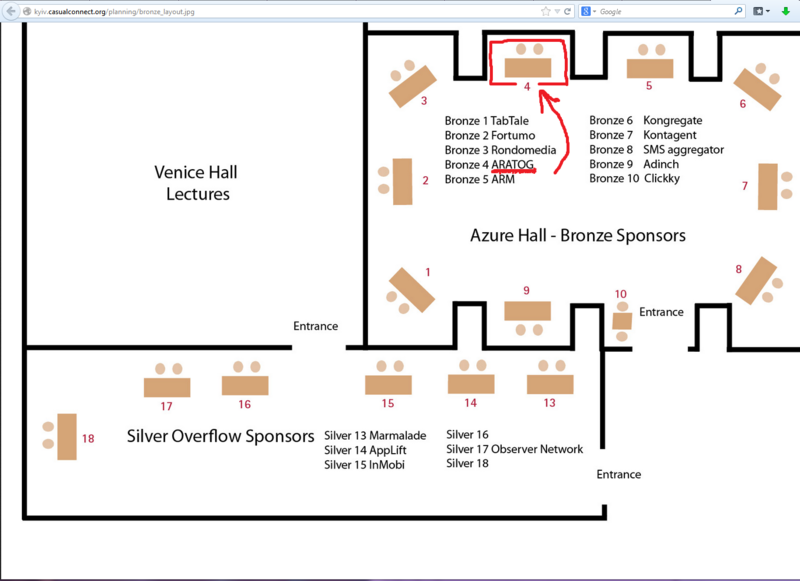 Will attend: Arseniy Nazarenko, Lyubov Nazarenko, Igor Goncharenko, Vadim Dyagilev and Sergey Serenko. 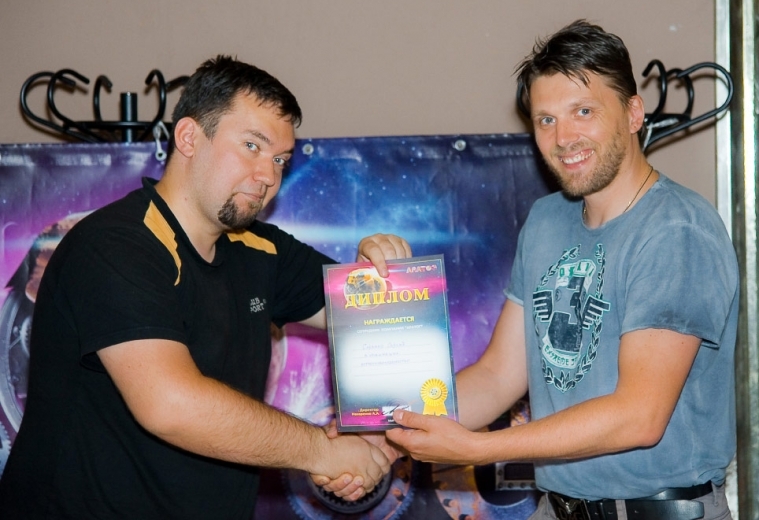 Aratog LLC was officially registered as IT company in Ukraine, who develop games and provide outsourcing services. We are proud to make quality games for people around the world! Also, we launched our new site at http://www.aratog.com domain. 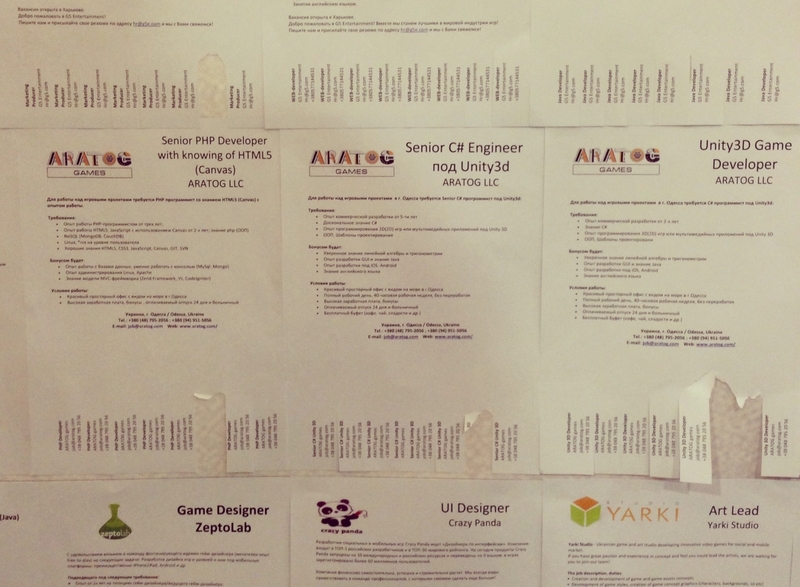 26.04.2012 we applied for registration in Ukraine gamedev company named ARATOG LLC. Our team already worked for Astro Lords project more then 6 months, but this was the first step in creating legal company at IT sector.